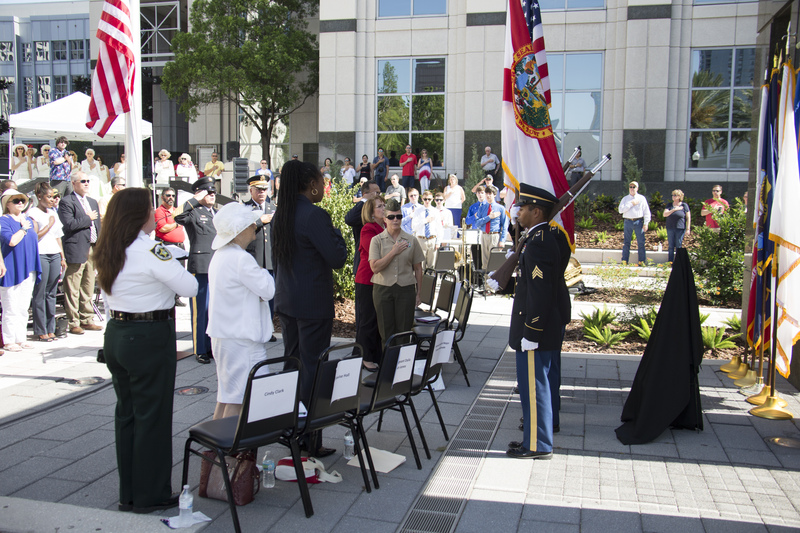 The ceremony also paid solemn tribute to fallen law enforcement officers, Orlando Police Department Lieutenant Debra Clayton and Orange County Sheriff’s Office Deputy First Class Norman Lewis, who both perished in the line of duty earlier this year. 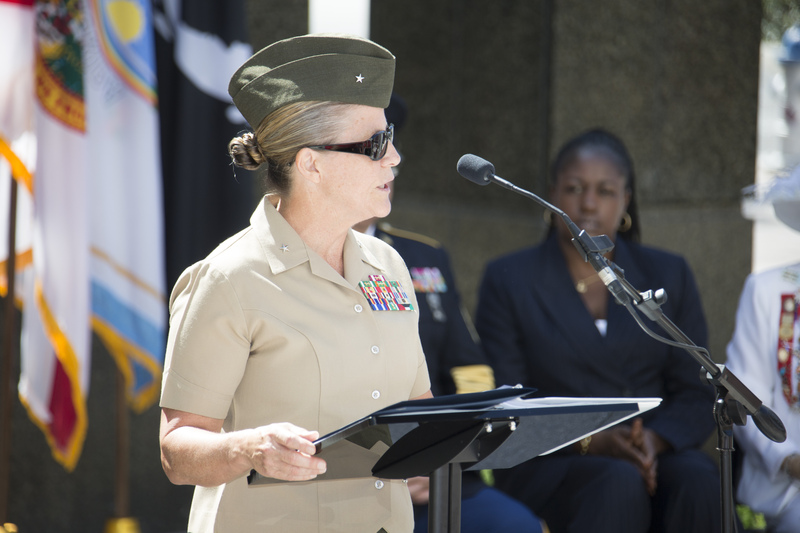 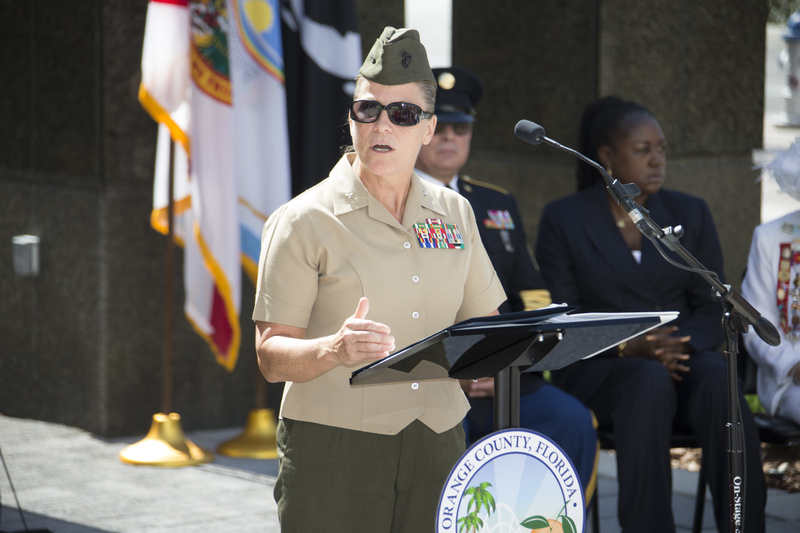 The ceremony’s keynote speaker was U.S. Marine Corps Reserve Brigadier General Helen G. Pratt. 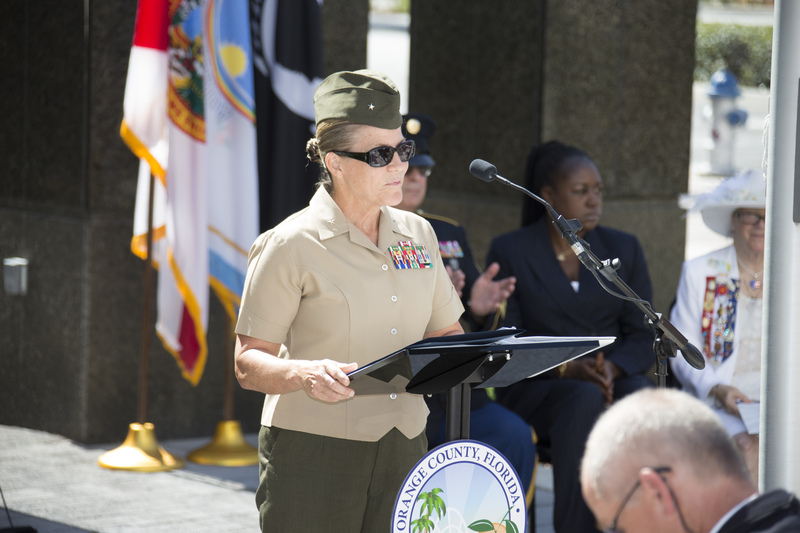 After completing her first tour of active duty in 1992, she joined the Reserves in Orlando with 6th MTBN and held the following positions, platoon commander, maintenance officer, executive officer and company commander. 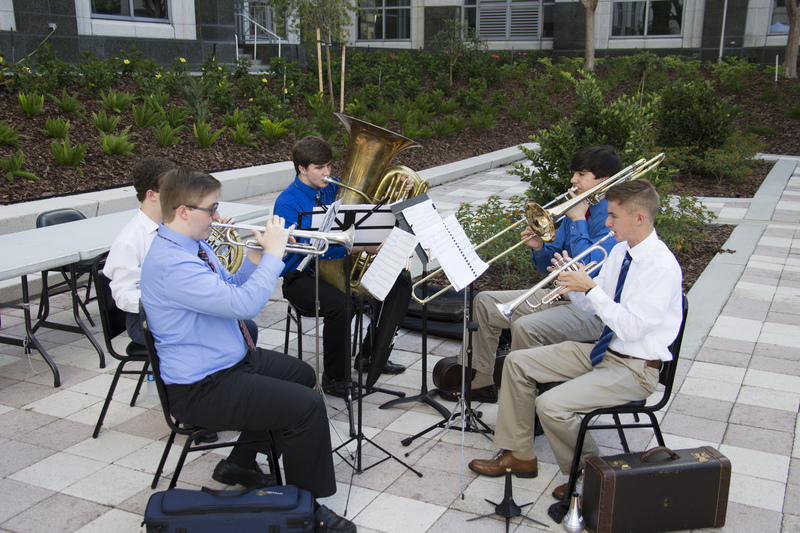 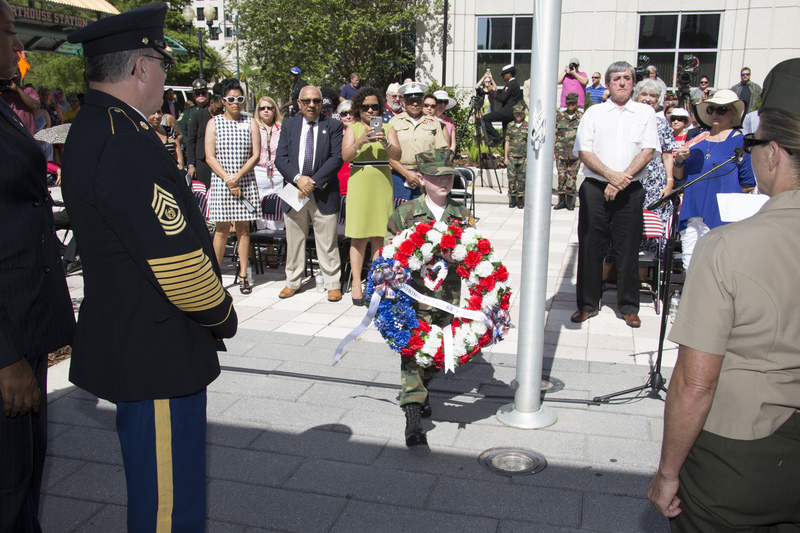 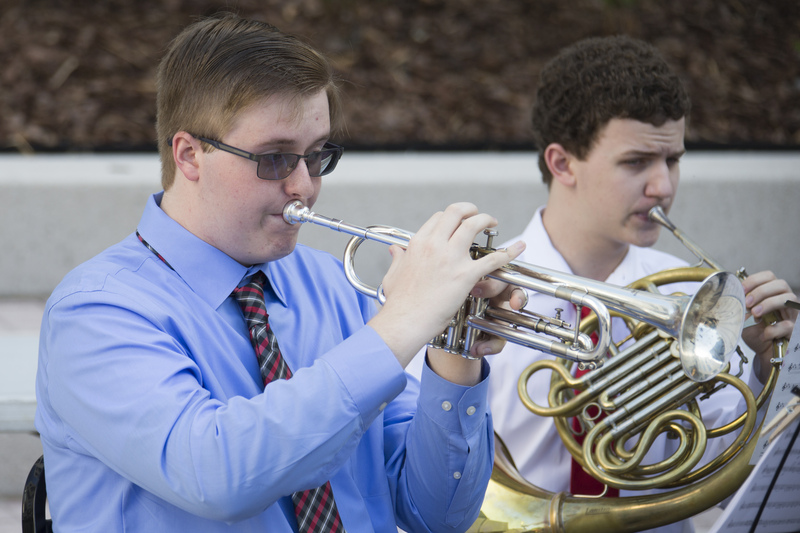 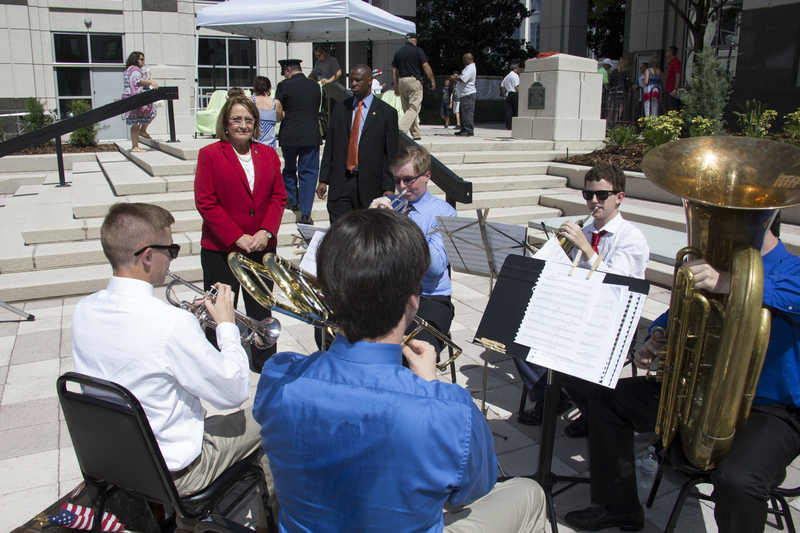 Brigadier General Pratt joined Mayor Jacobs and the Orlando Devil Dogs Young Marines Unit, in the laying of a commemorative wreath, which was followed by the playing of “Taps,” performed by the Winter Park High School Brass Quintet. 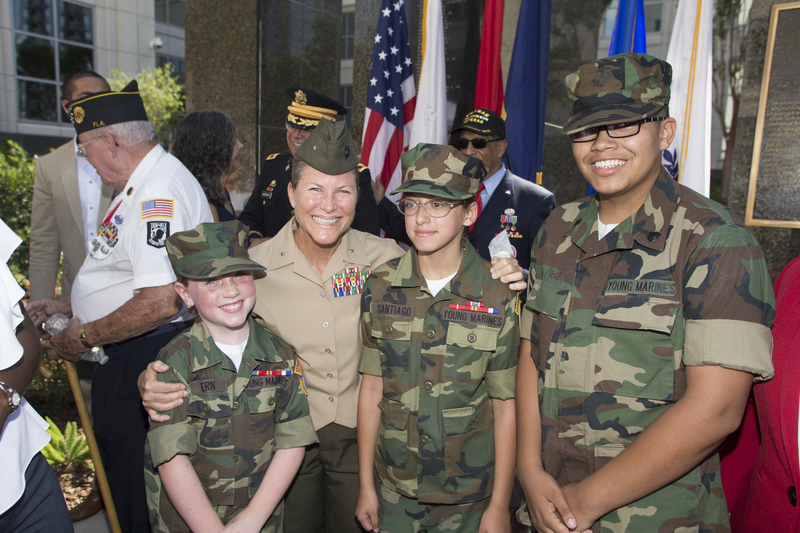 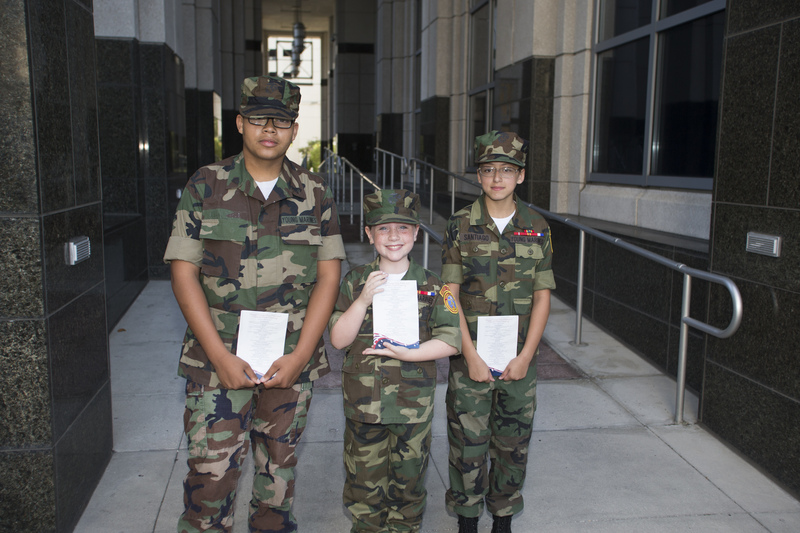 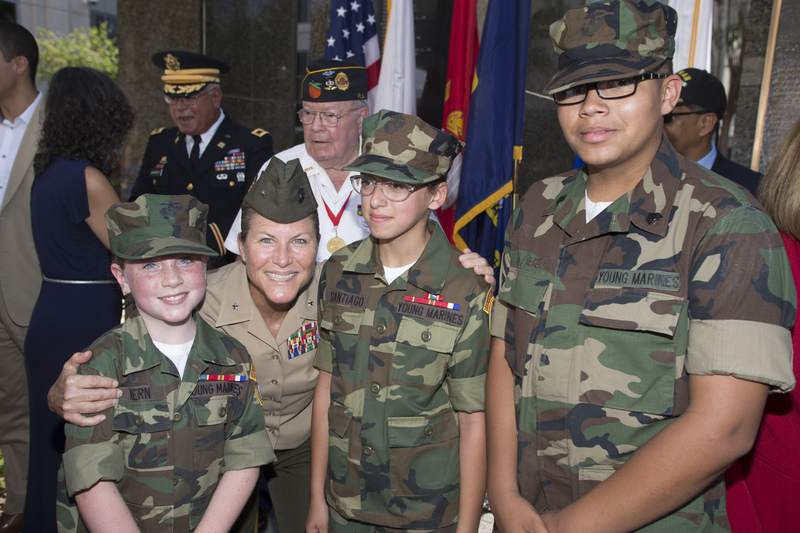 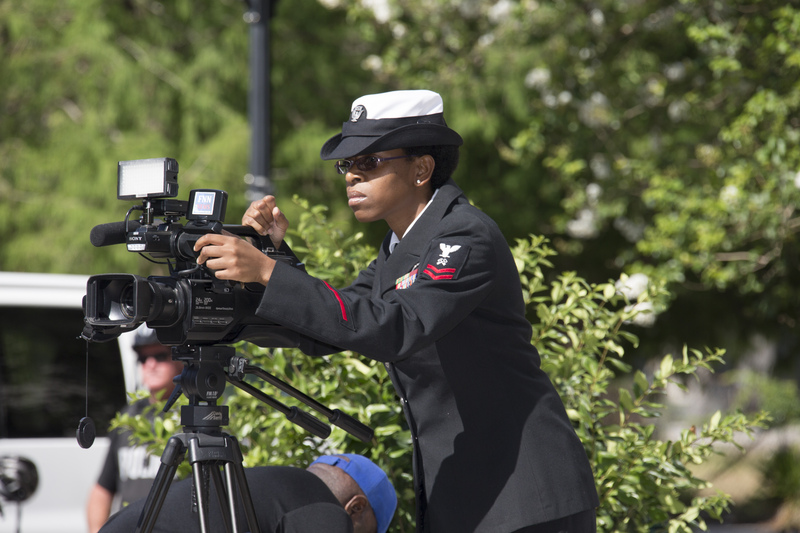 The Young Marines is a national non-profit youth education and service program for boys and girls that promotes the mental, moral and physical development of its members. 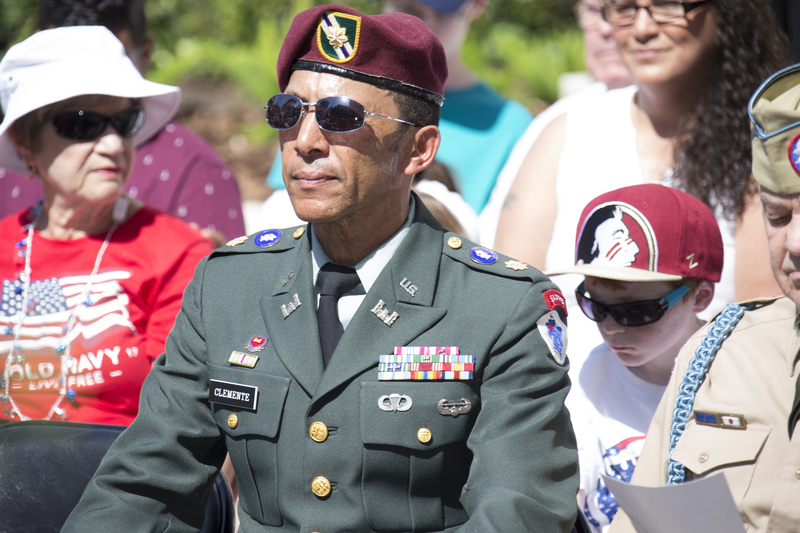 The Orlando Devil Dogs are the local affiliate unit. 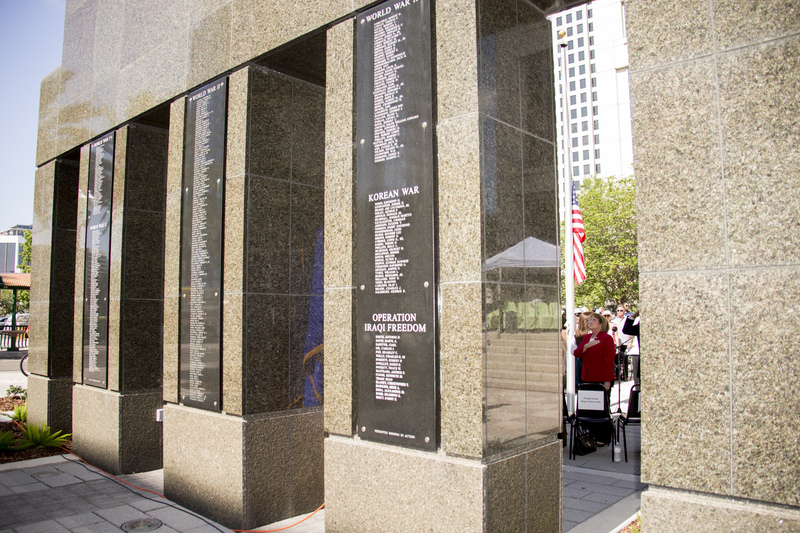 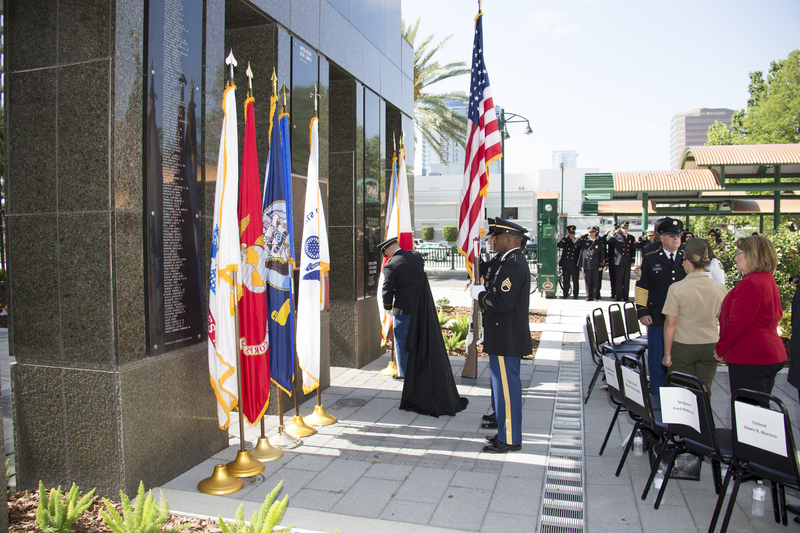 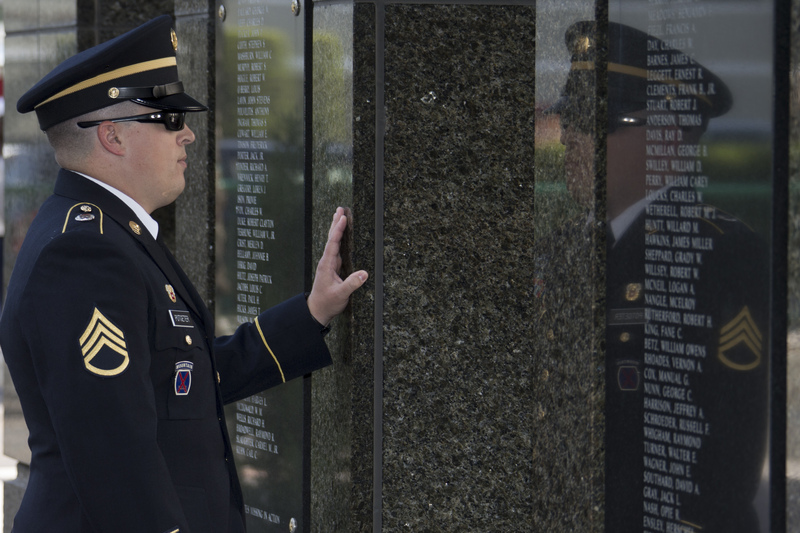 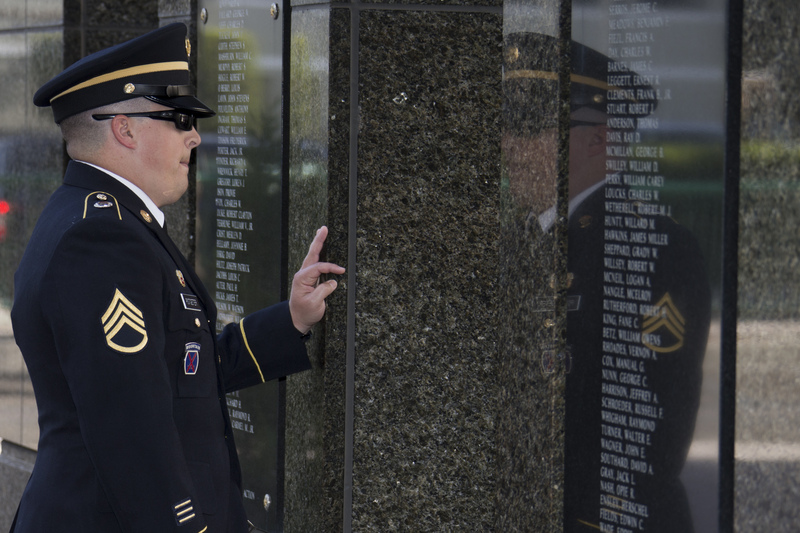 The Memorial Wall features the names of the service men and women who lost their lives serving in the Armed Forces. 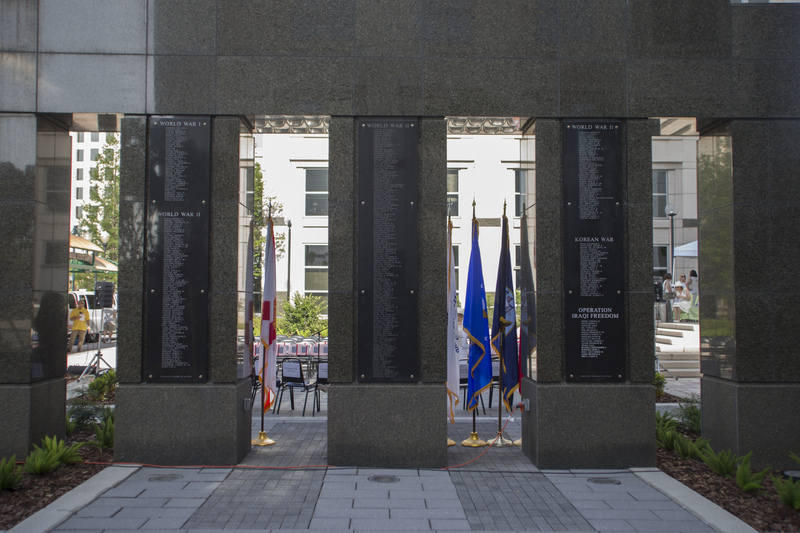 No new names were added to the memorial this year. 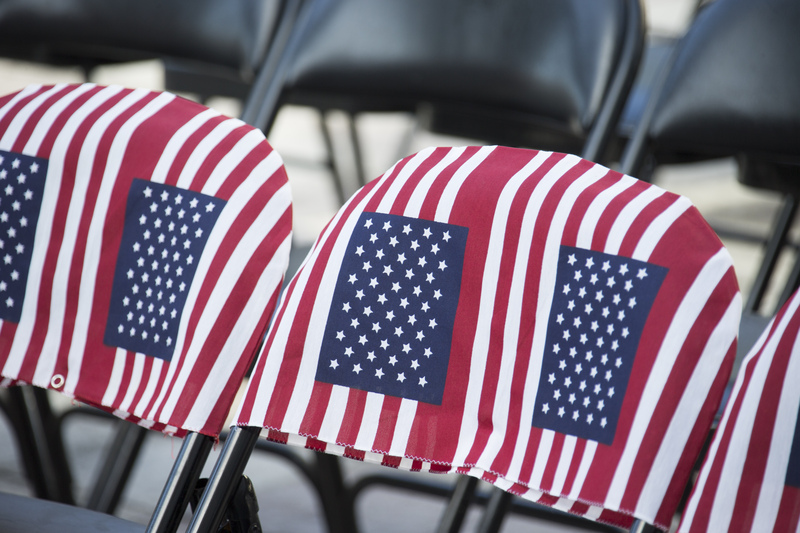 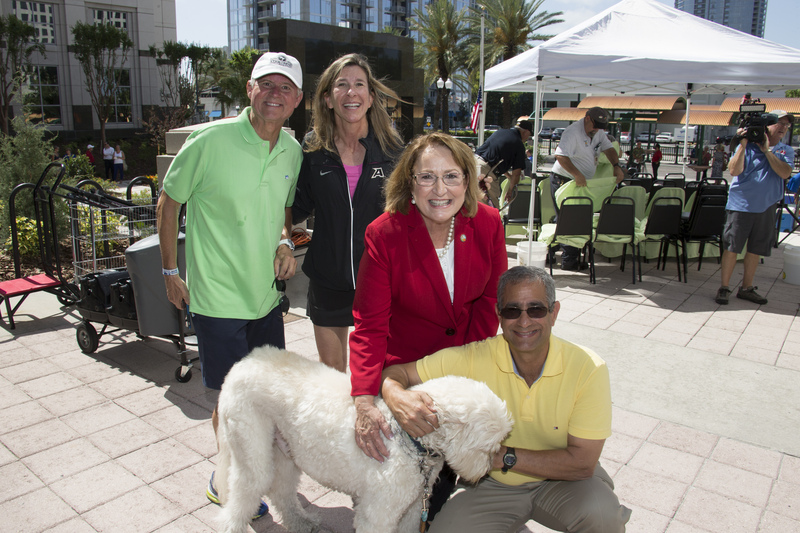 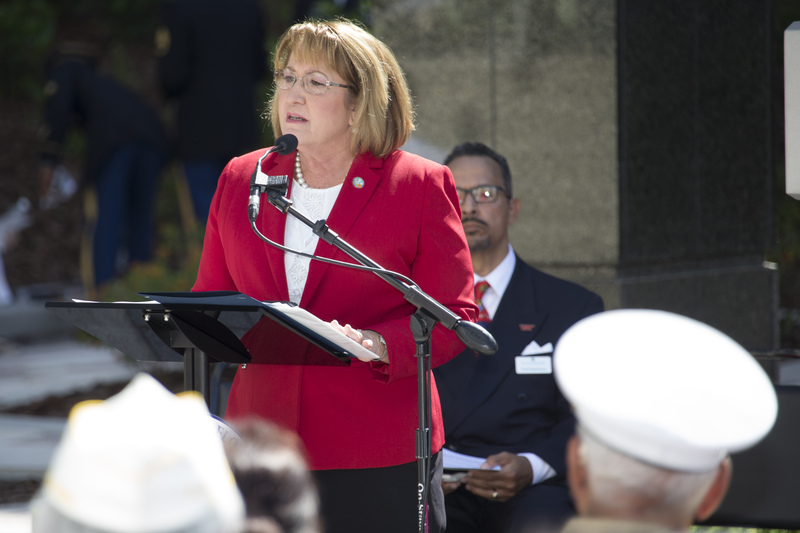 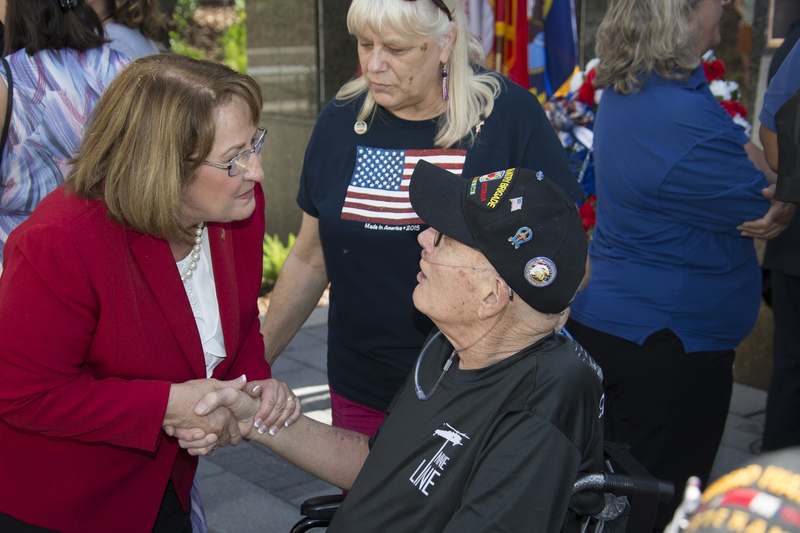 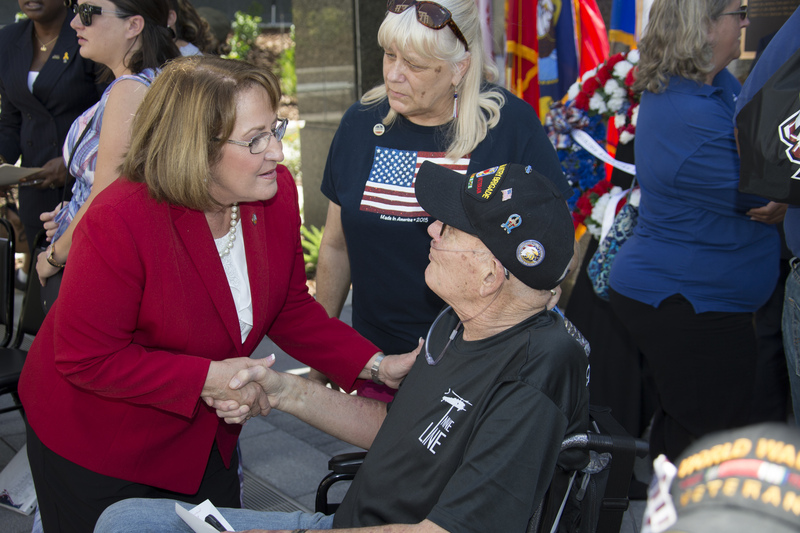 Mayor Jacobs also read a resolution encouraging citizens to observe Memorial Day and pay special tribute to those who gave their lives in the name of freedom and democracy. 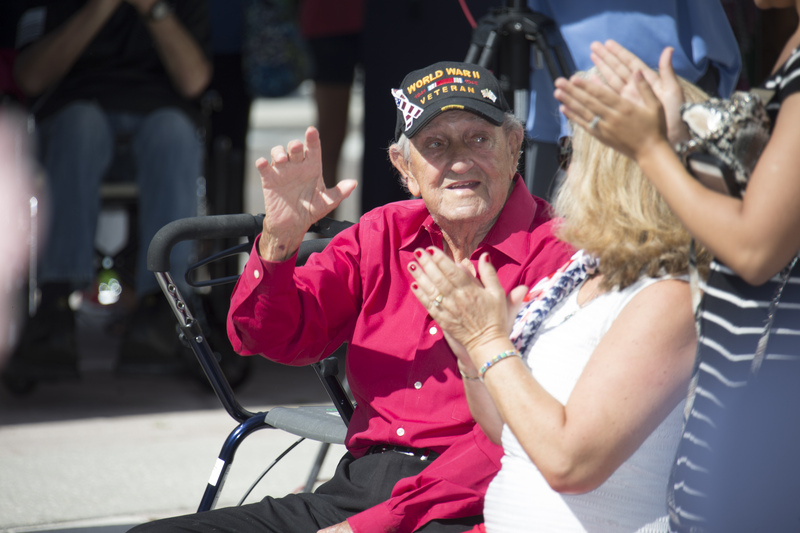 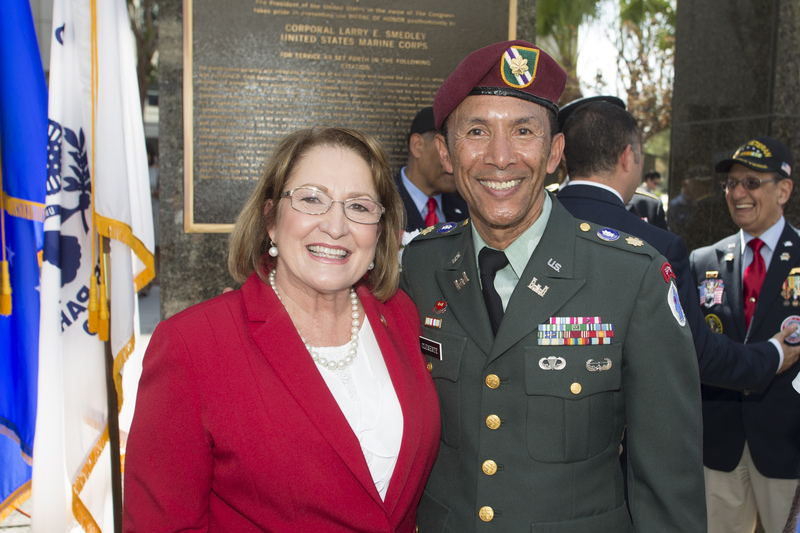 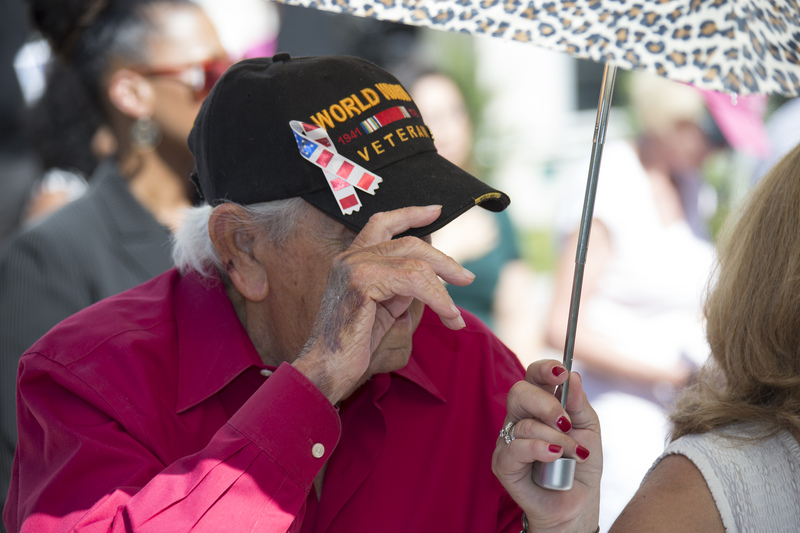 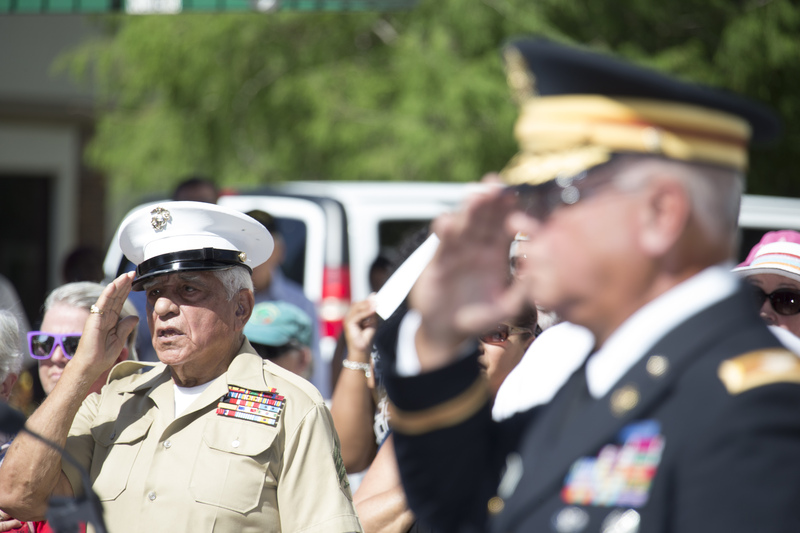 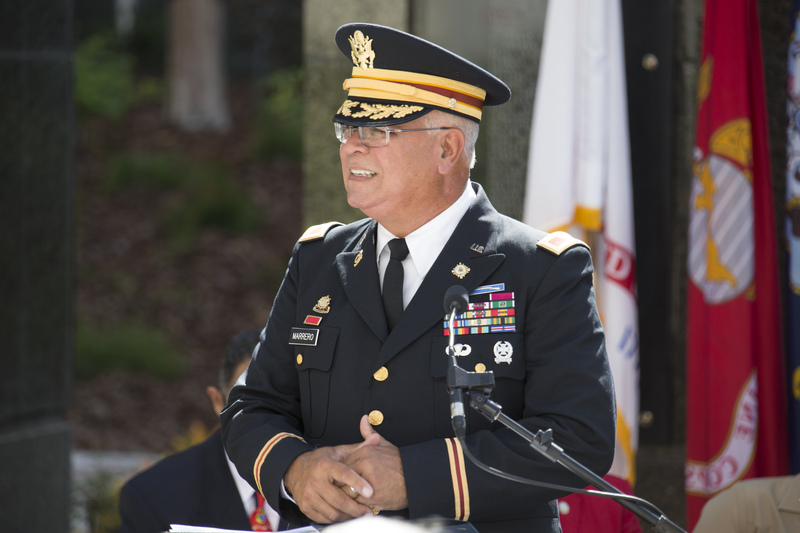 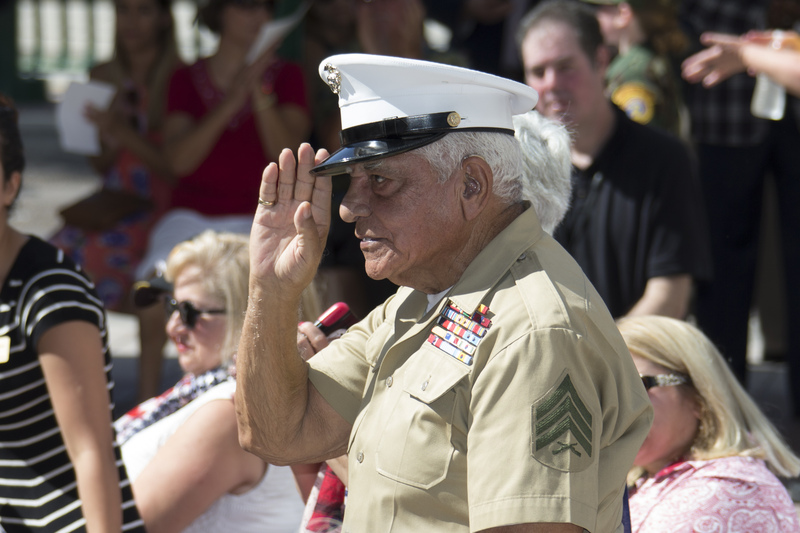 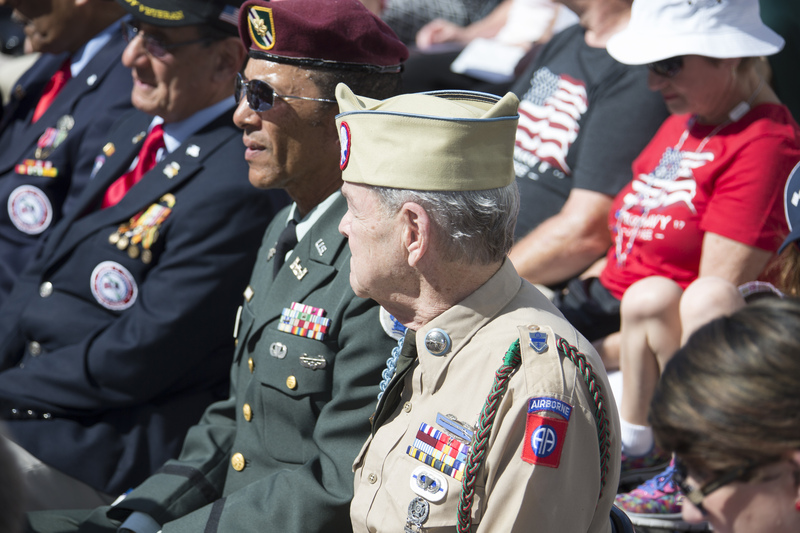 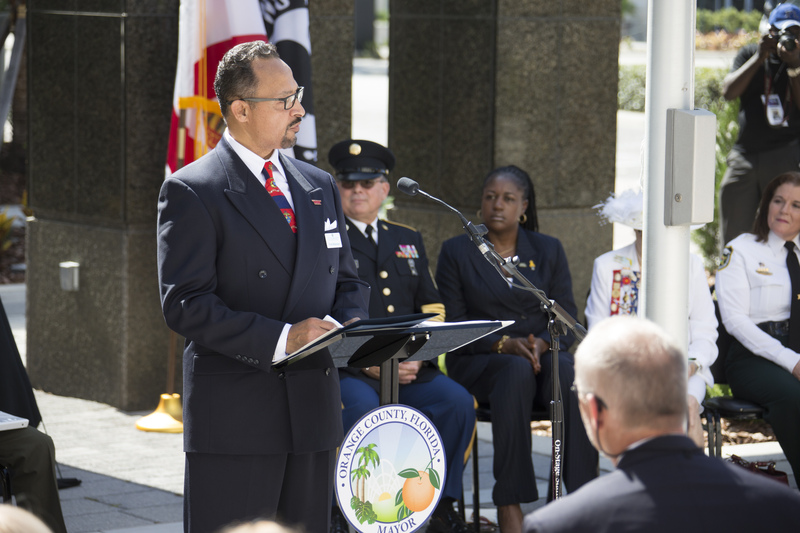 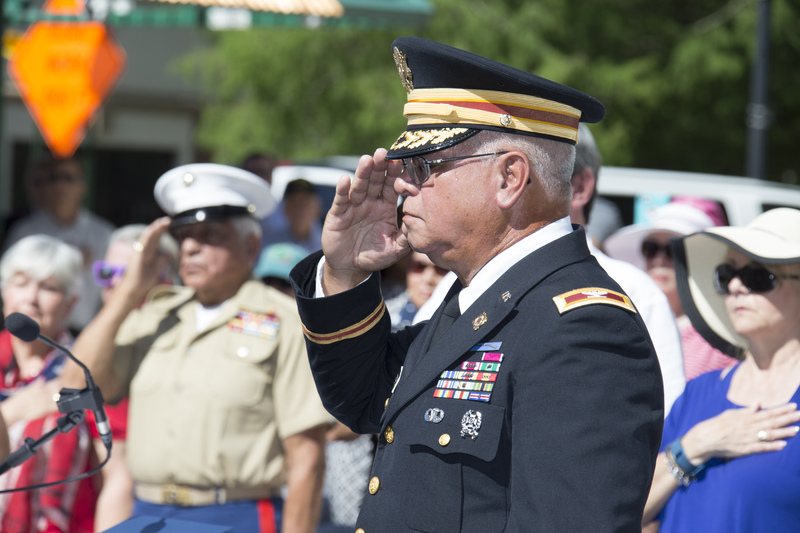 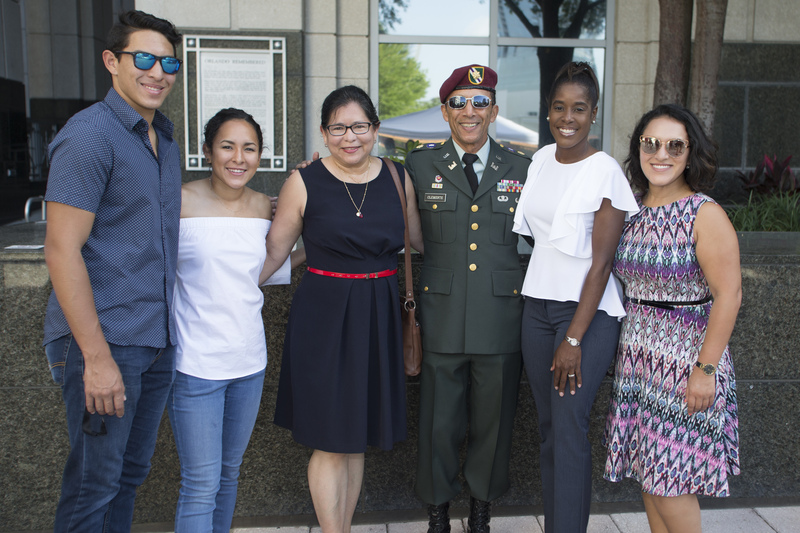 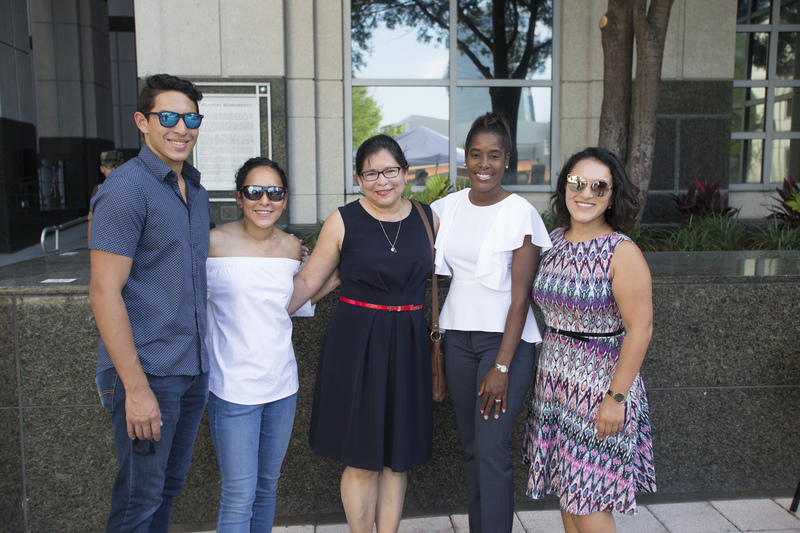 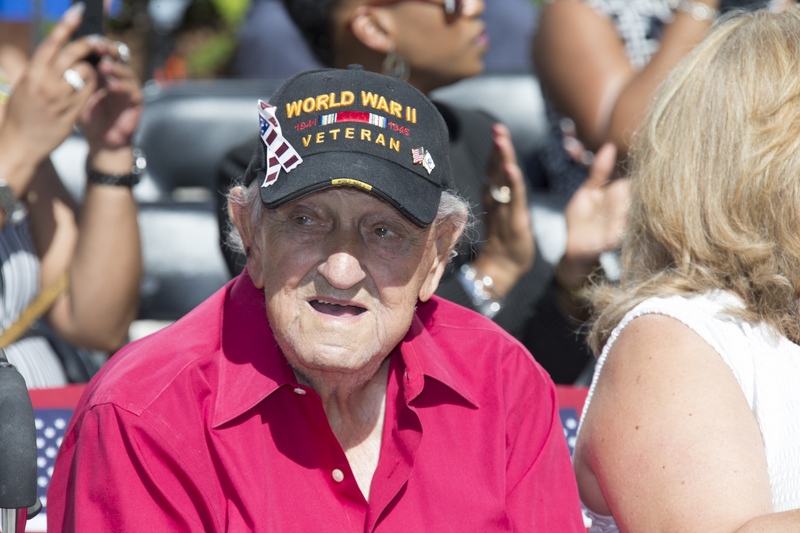 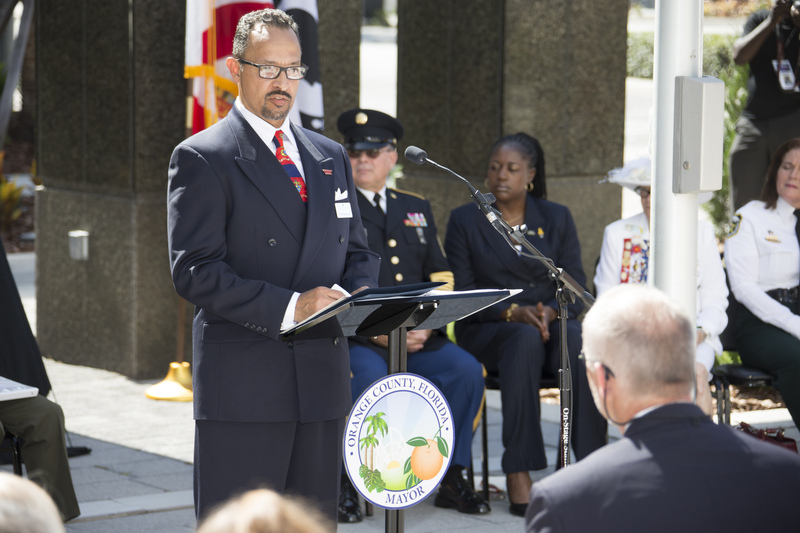 Retired U.S. Army Colonel Edwin R. Marrero, Chairman of Orange County Mayor’s Veterans Advisory Council, hosted the ceremony. 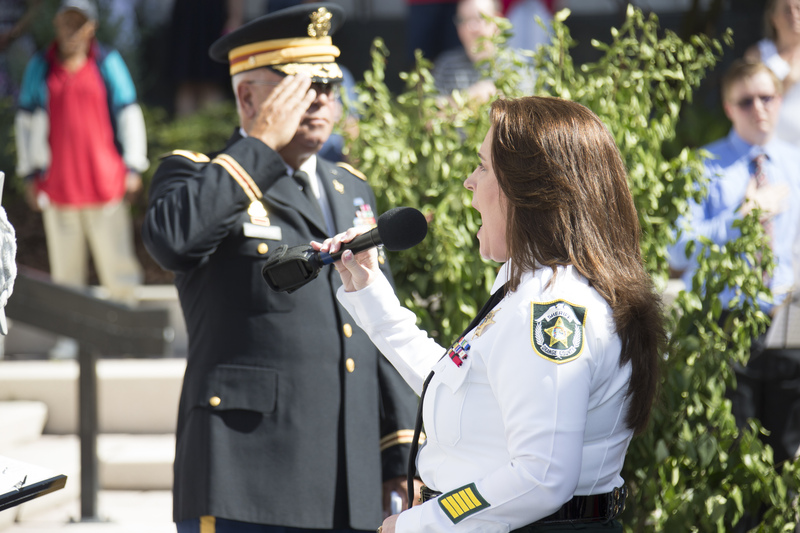 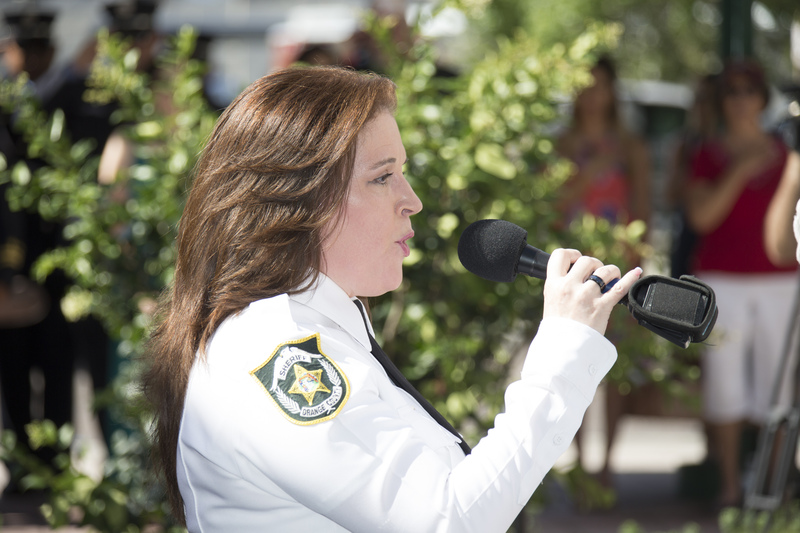 Command Sergeant Major Tommie Maldonado, the Orange County Veterans Service Officer, led the Pledge of Allegiance. 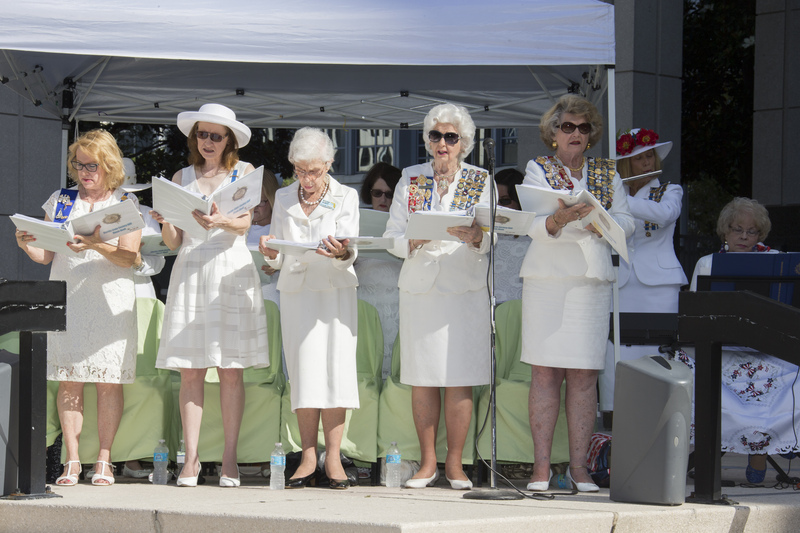 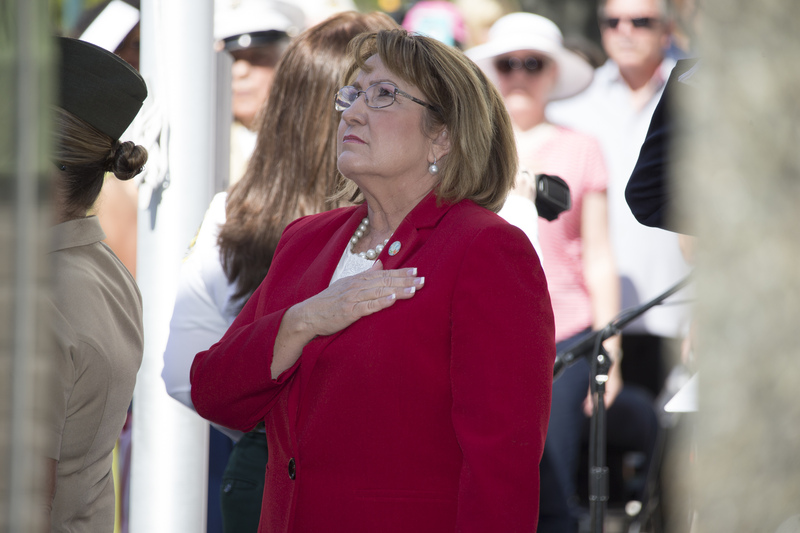 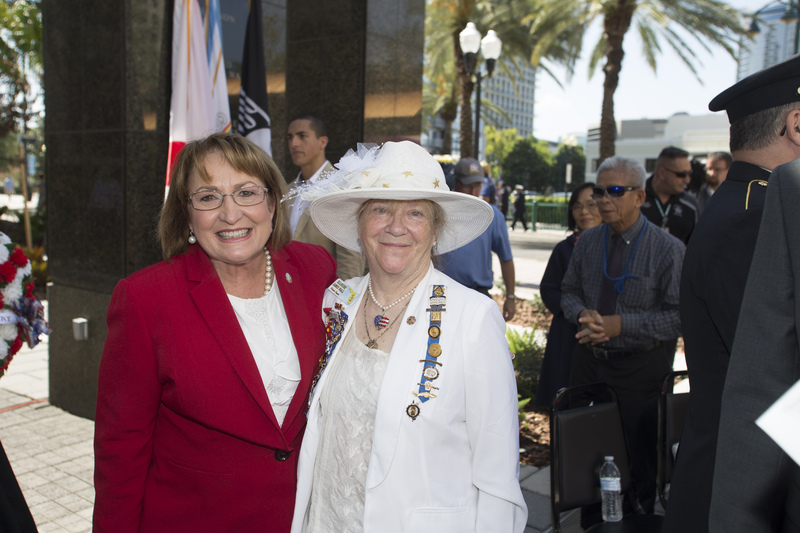 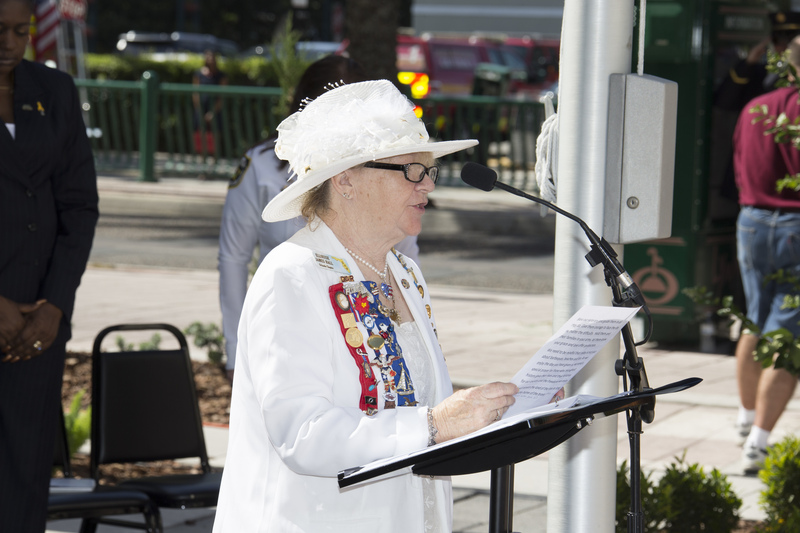 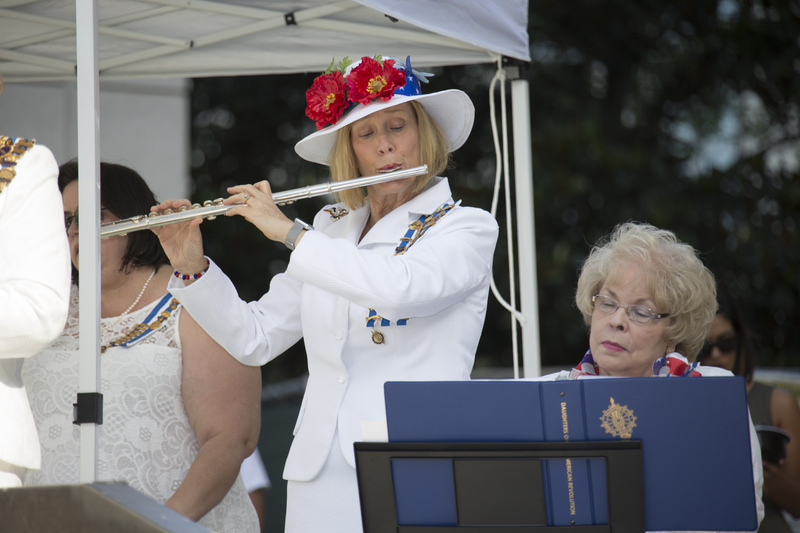 Elouise Hall, member of the Orange County Mayor’s Veterans Advisory Council and a member of the Daughters of the American Revolution, provided the Invocation. 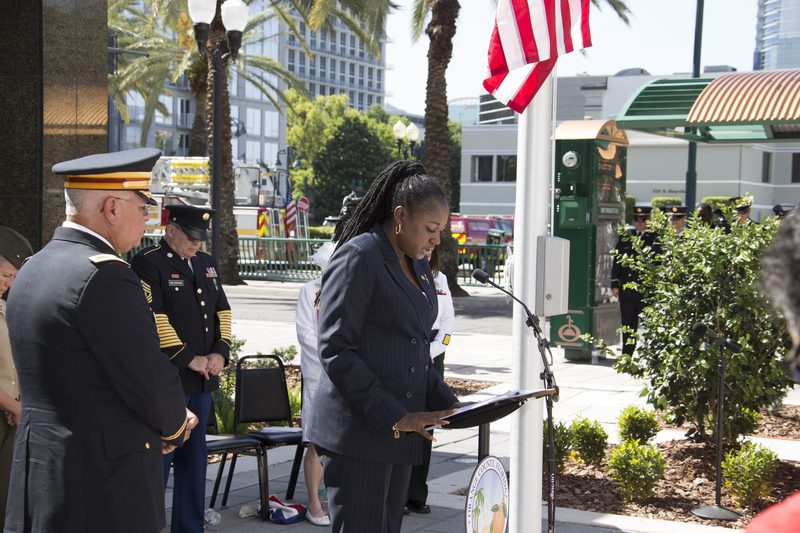 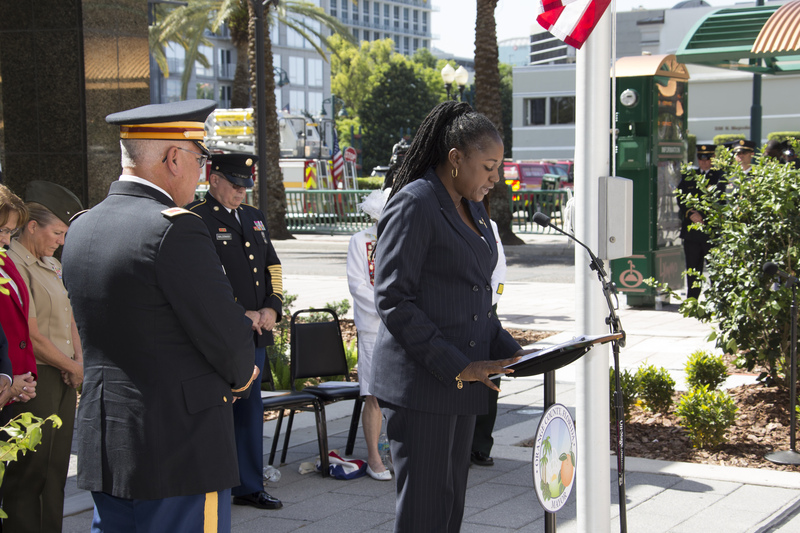 City of Orlando Mayor’s Veterans Advisory Council member, Sergeant Fred Robinson, introduced Brigadier General Pratt who gave the keynote speech, and member of the Orange County Mayor’s Veterans Advisory Council, First Sergeant Daila Espeut-Jones delivered the Benediction. 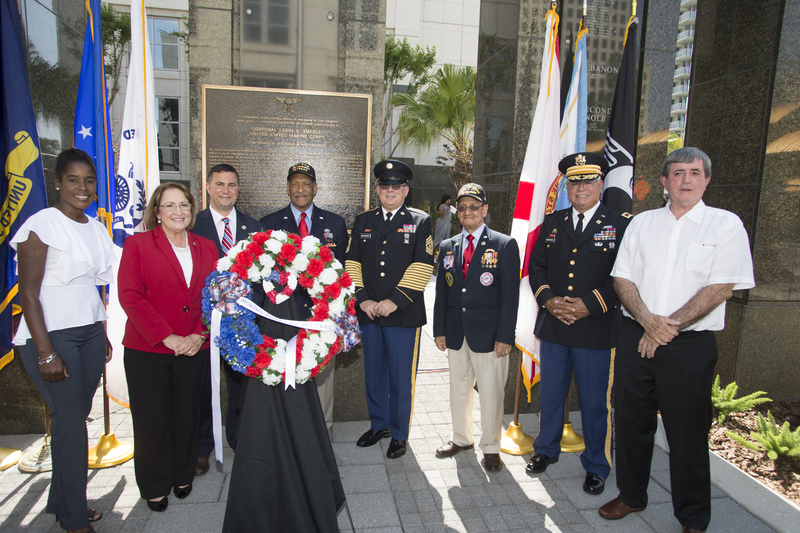 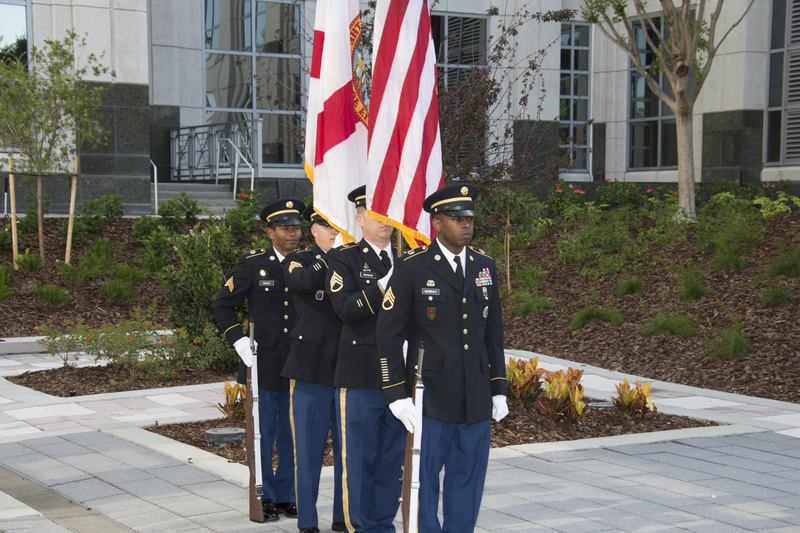 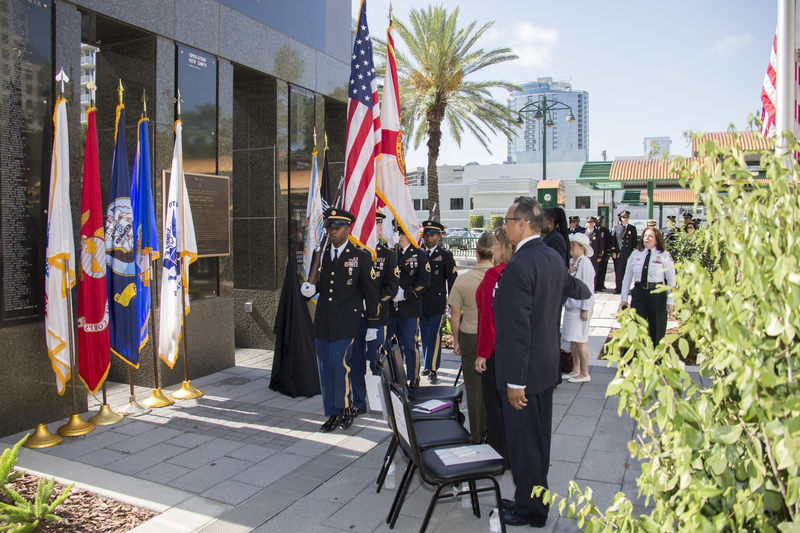 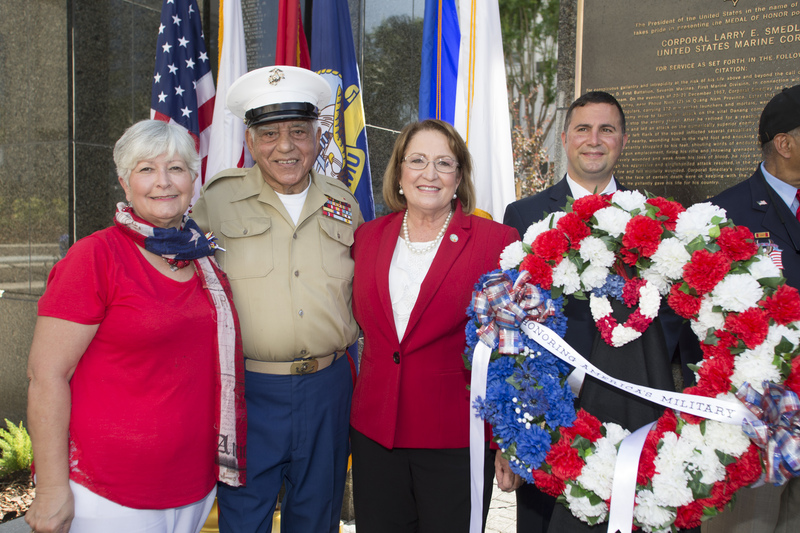 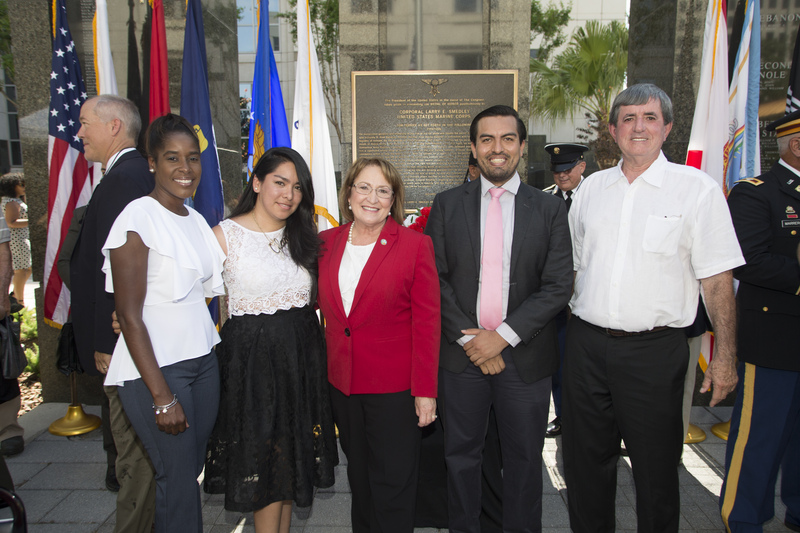 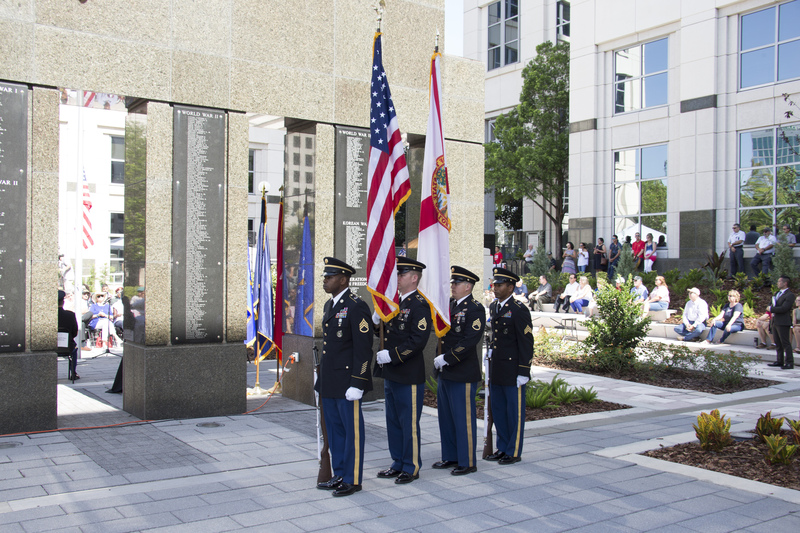 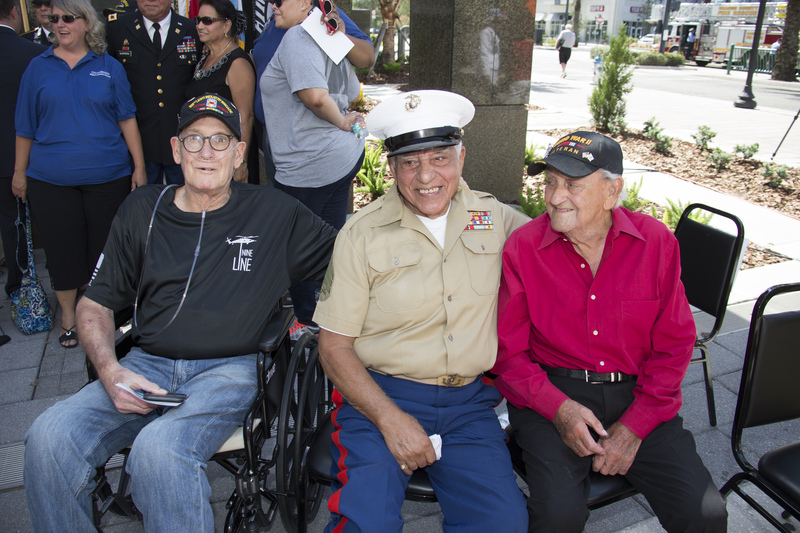 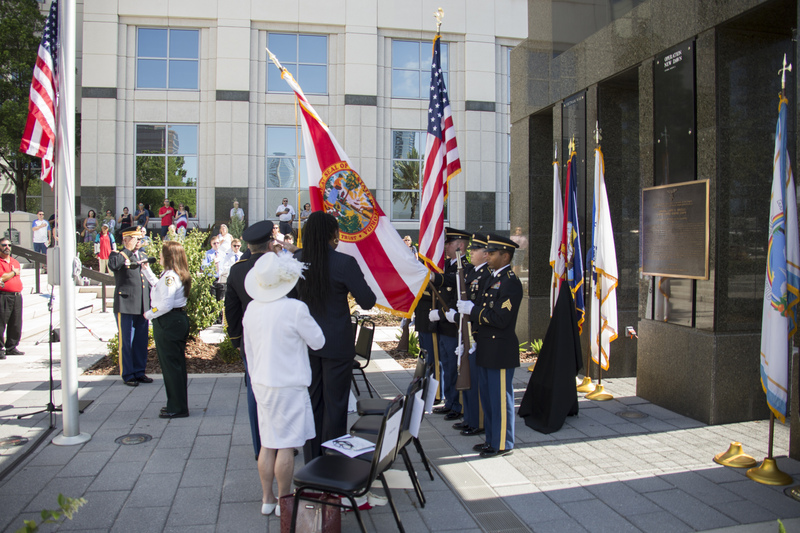 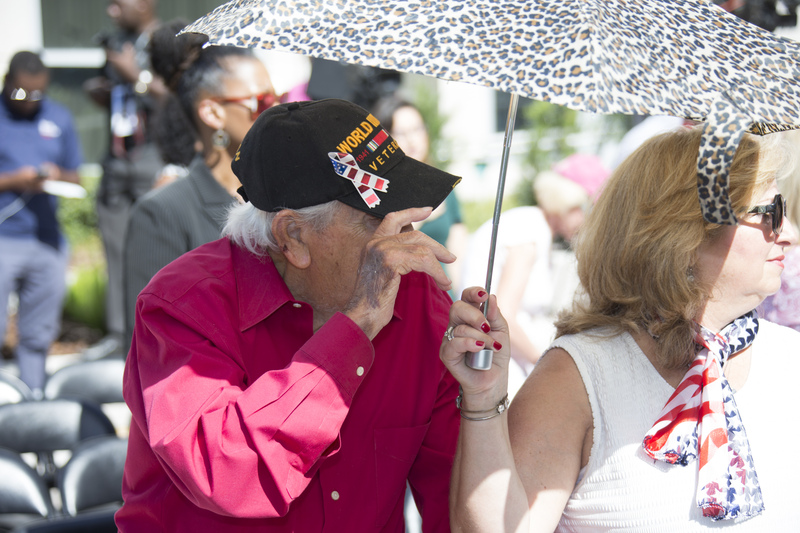 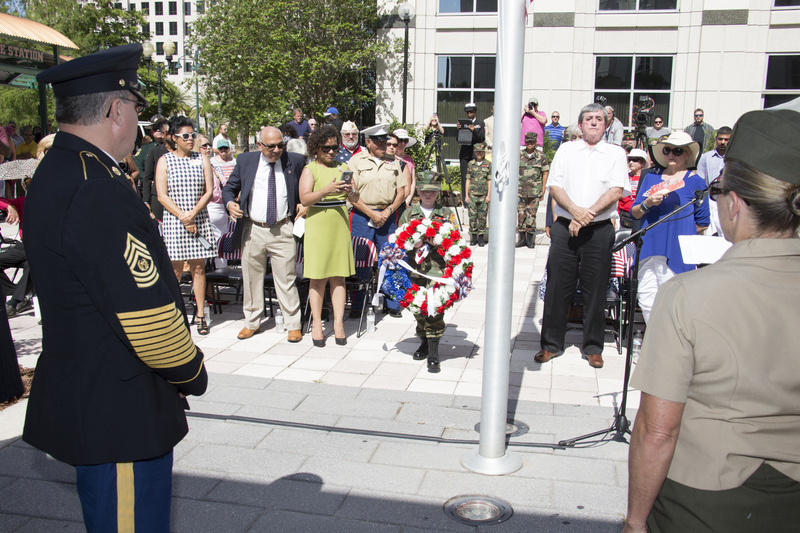 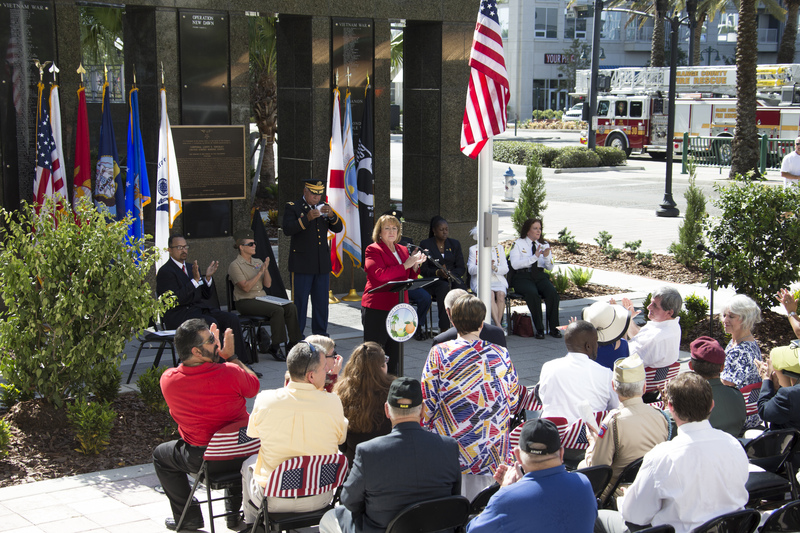 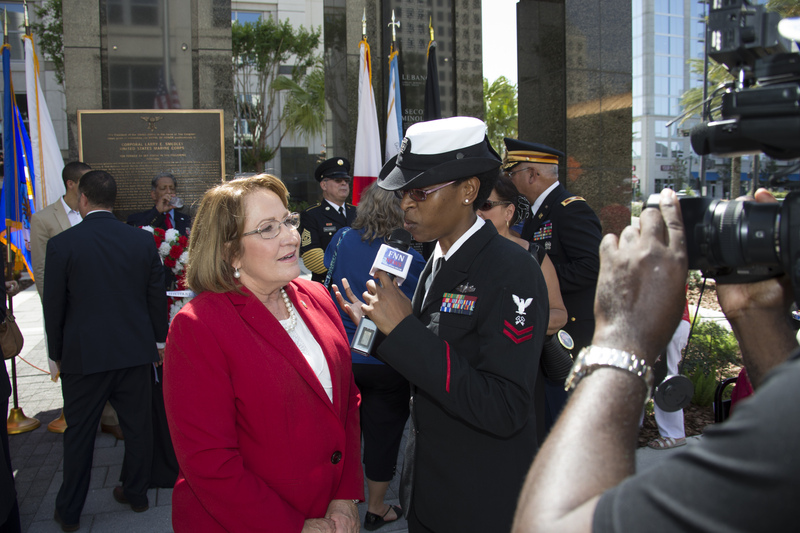 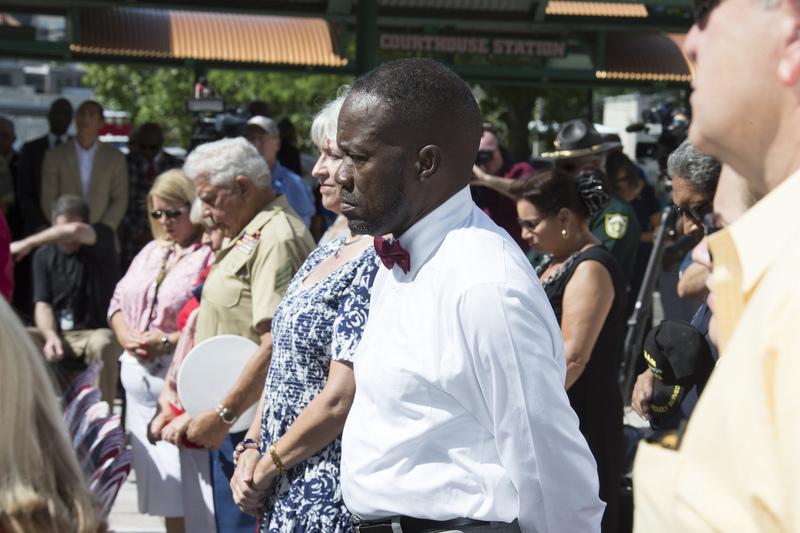 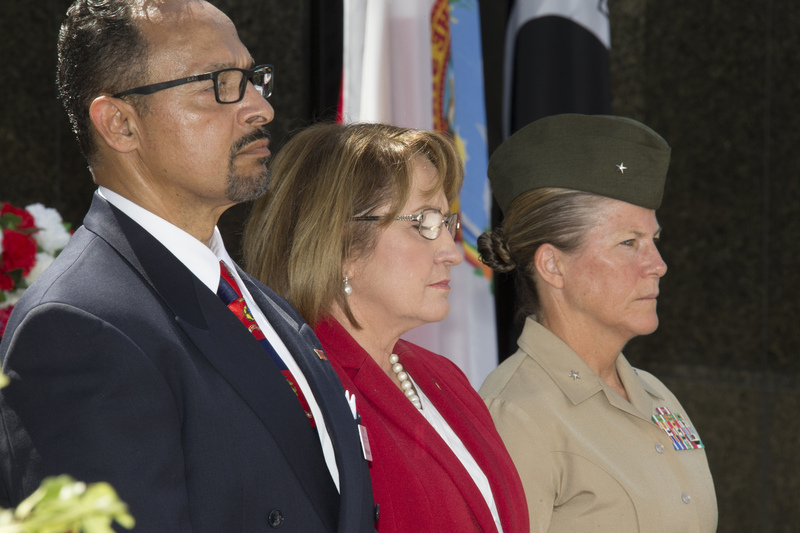 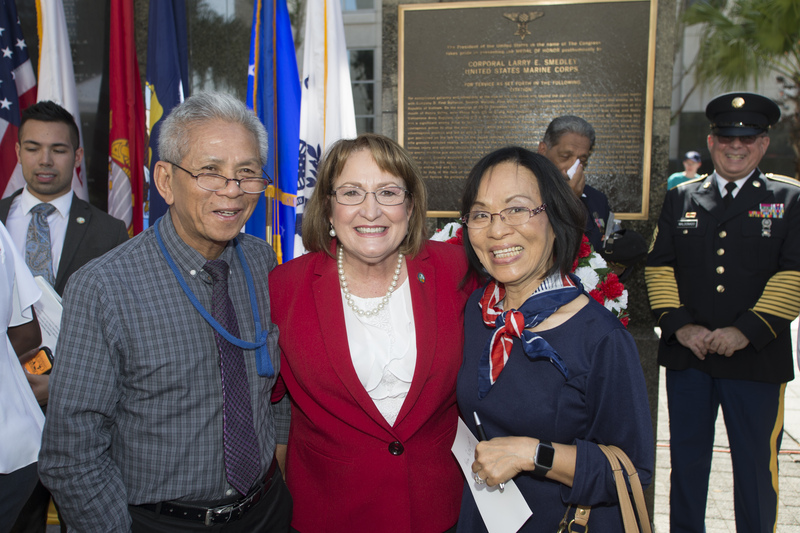 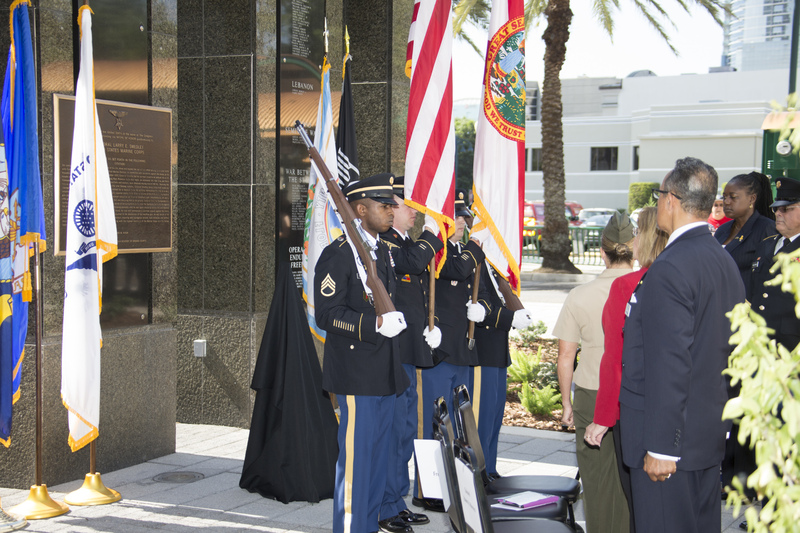 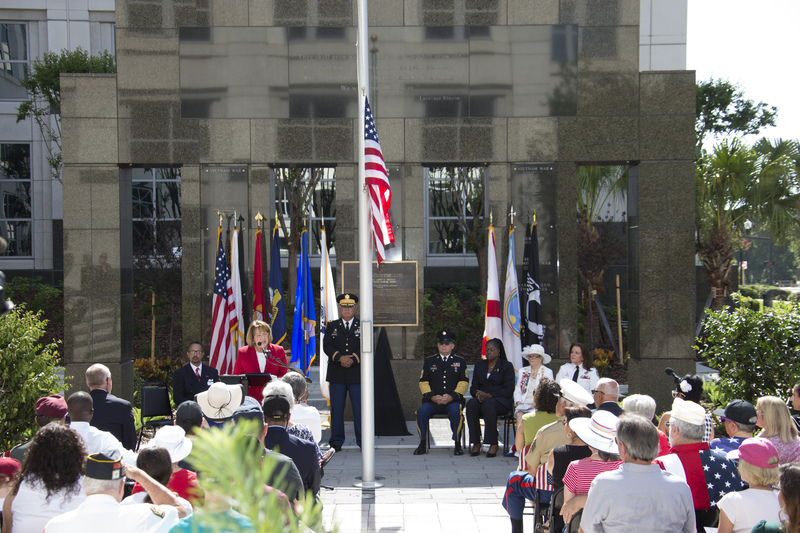 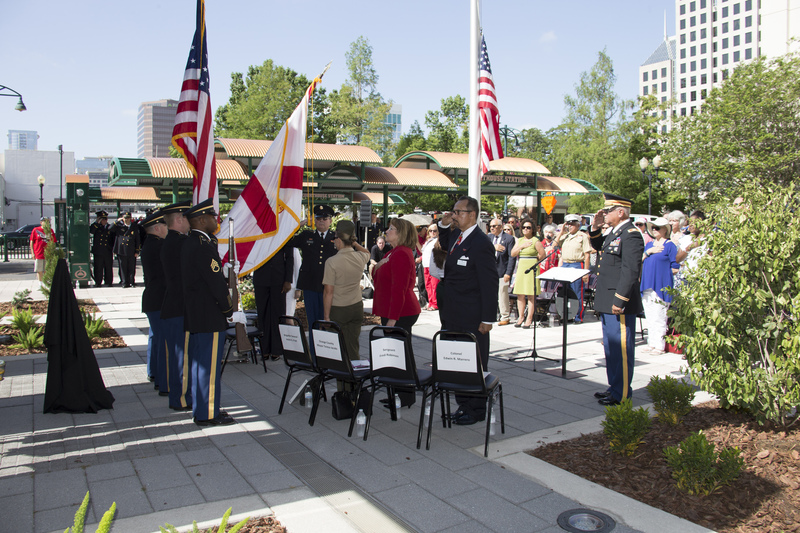 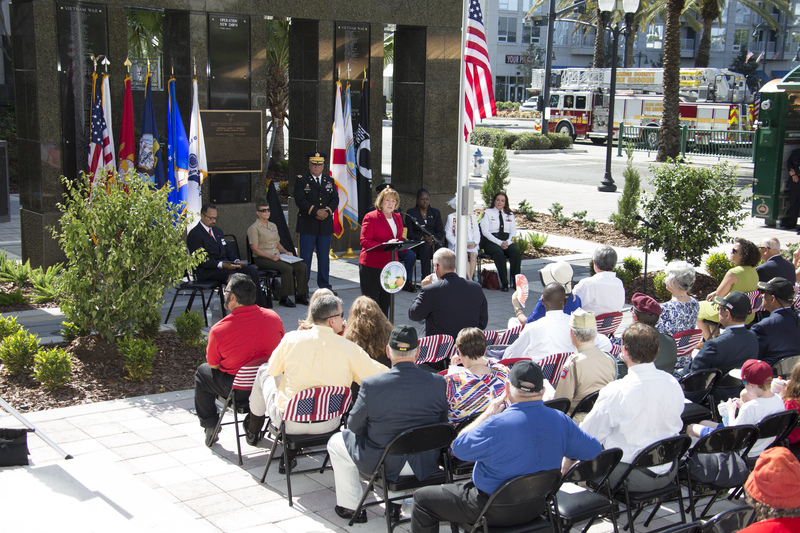 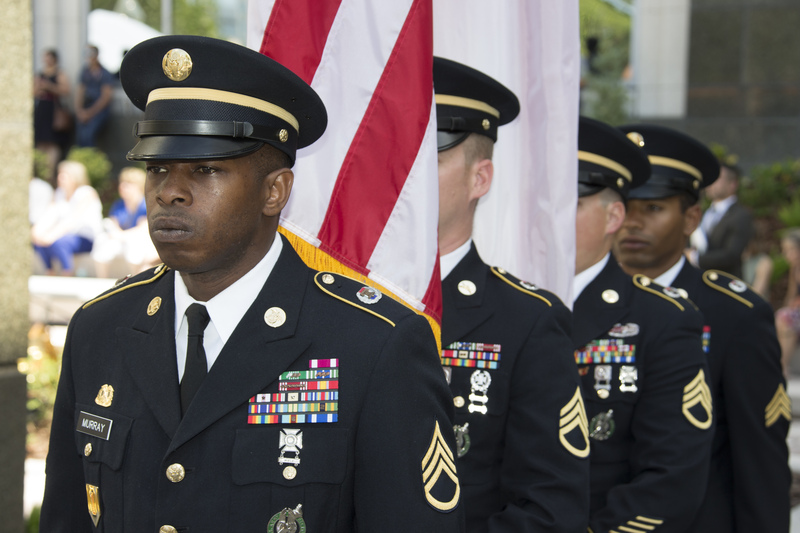 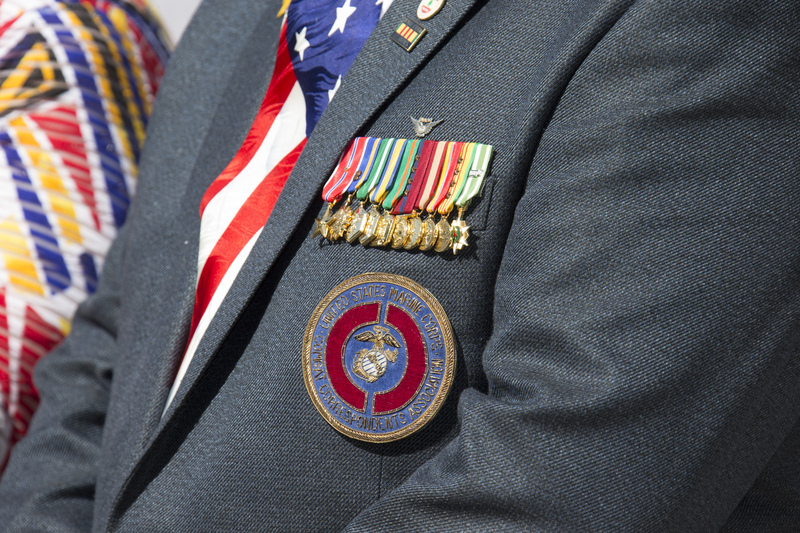 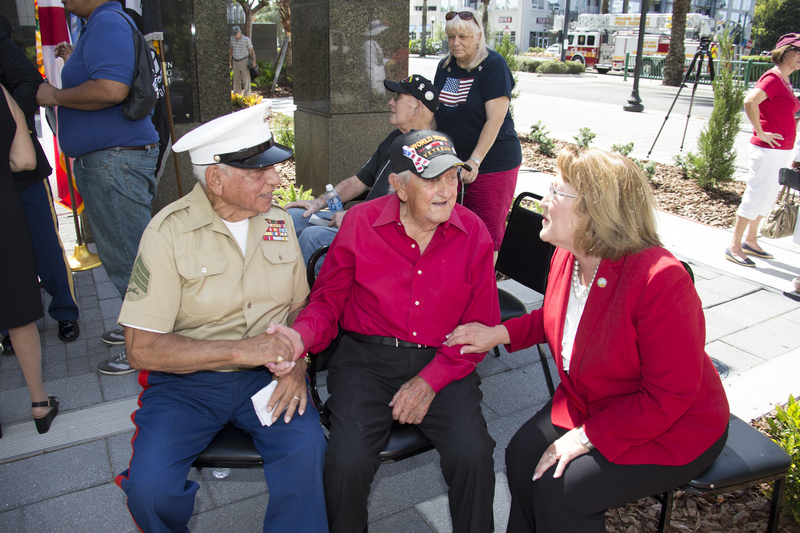 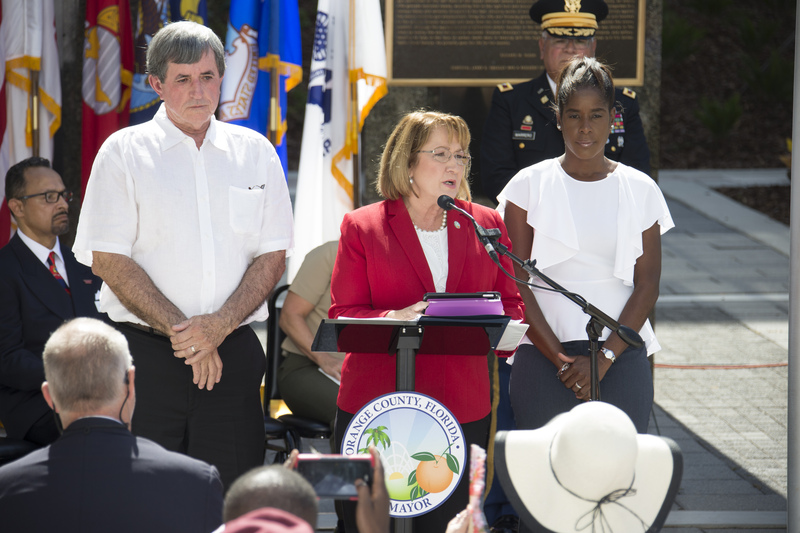 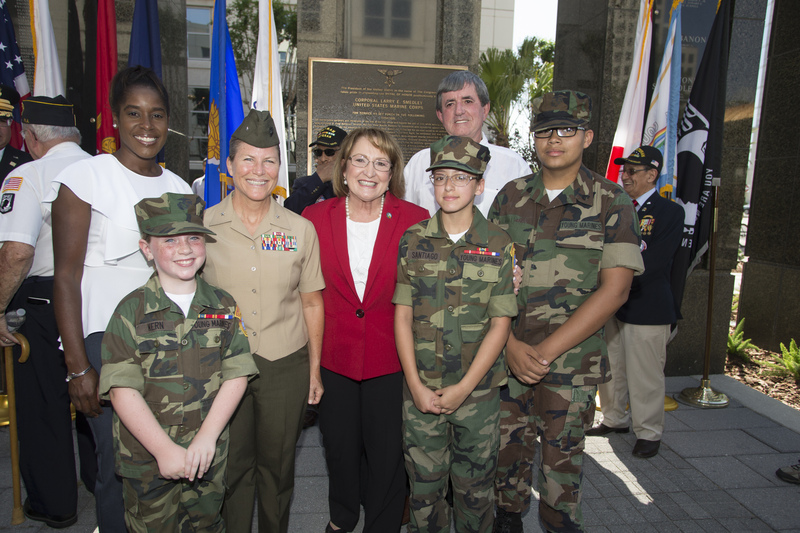 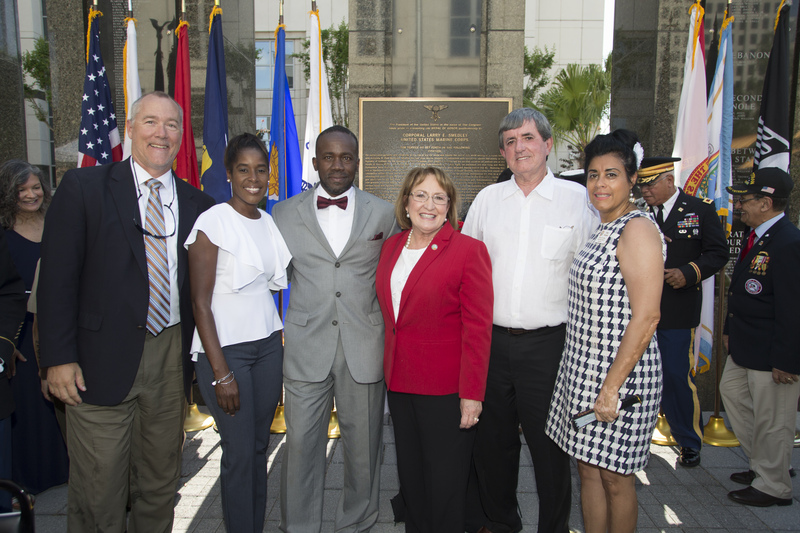 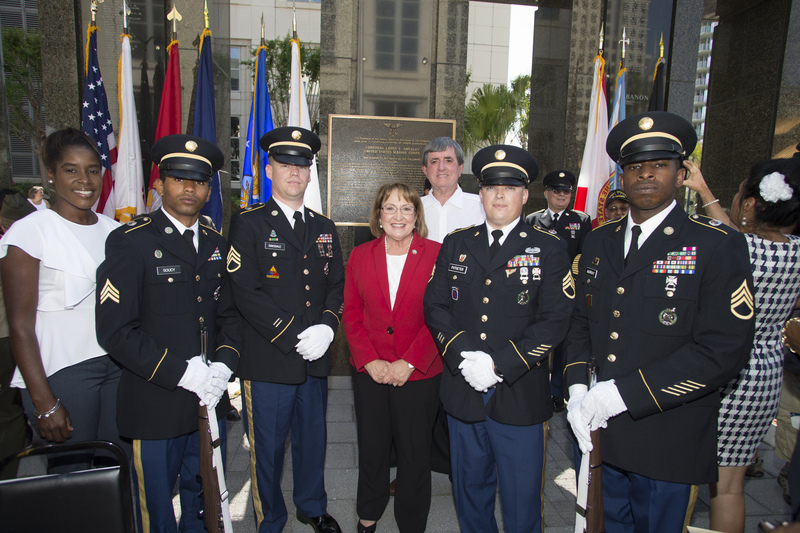 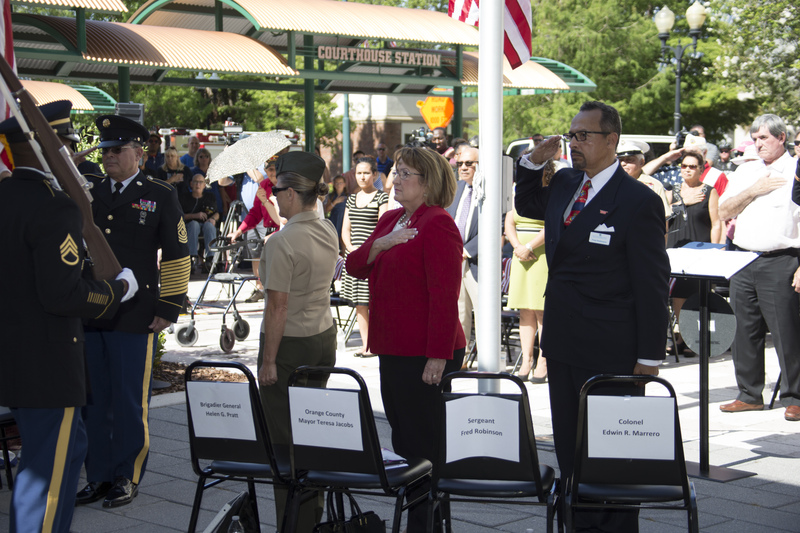 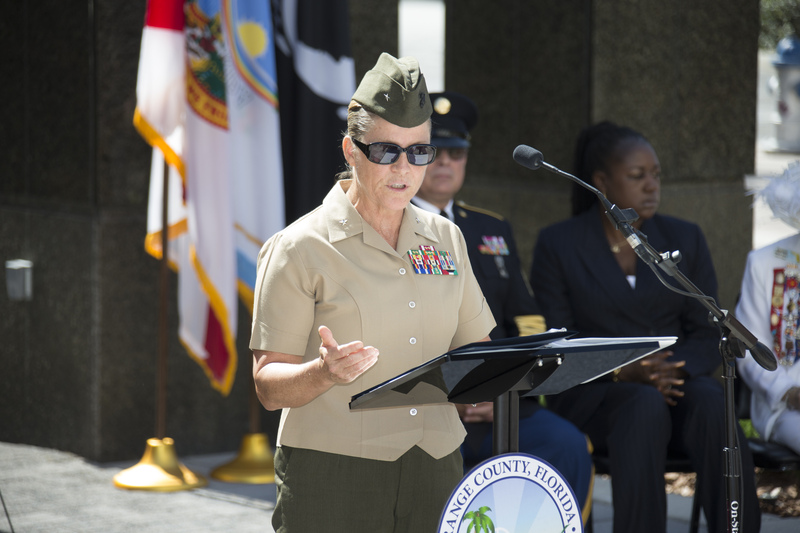 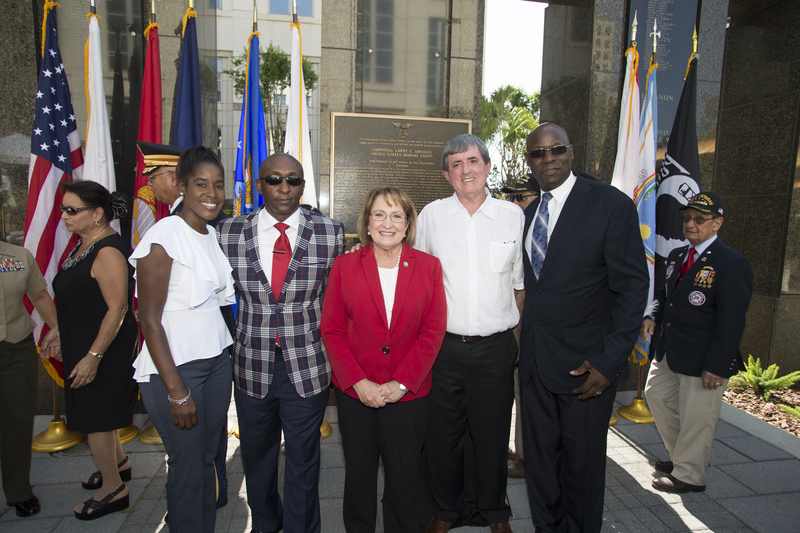 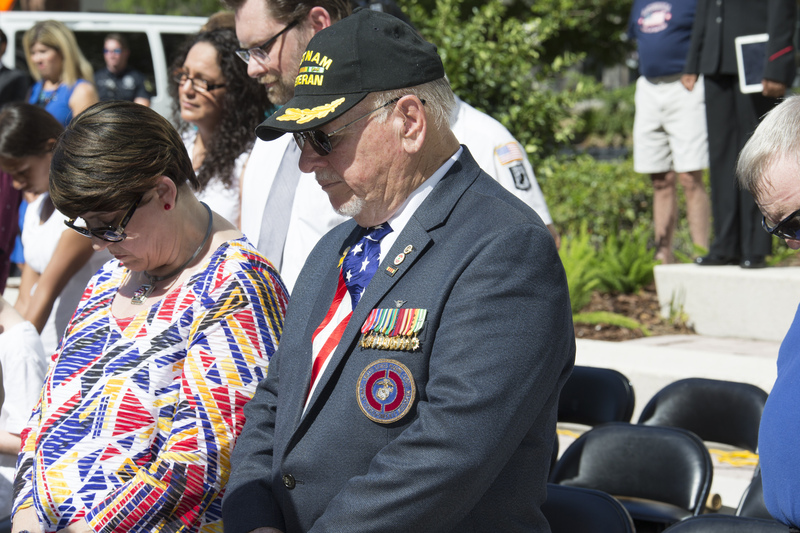 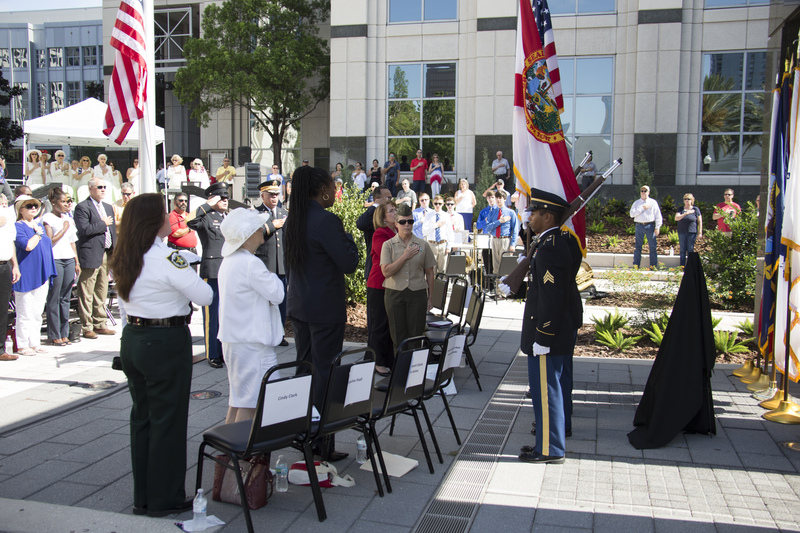 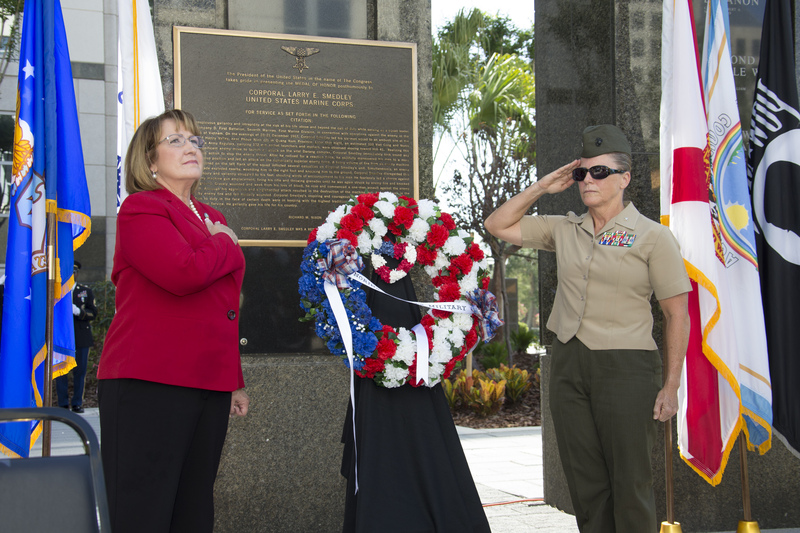 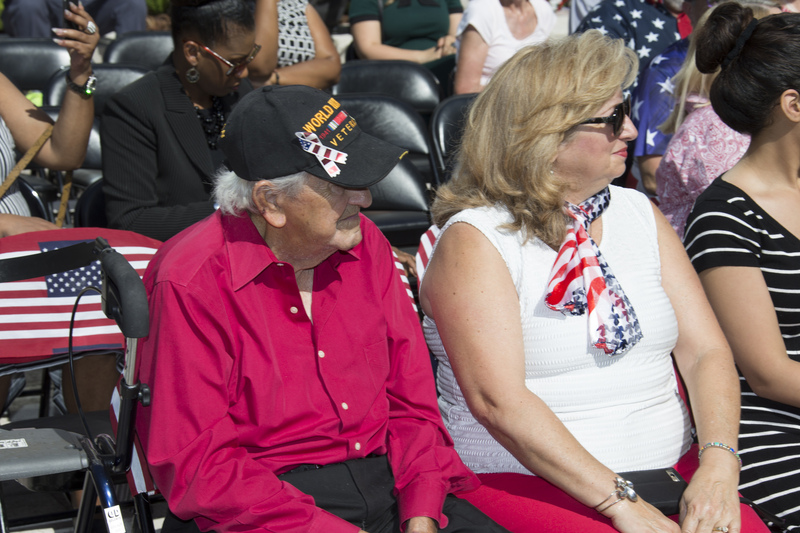 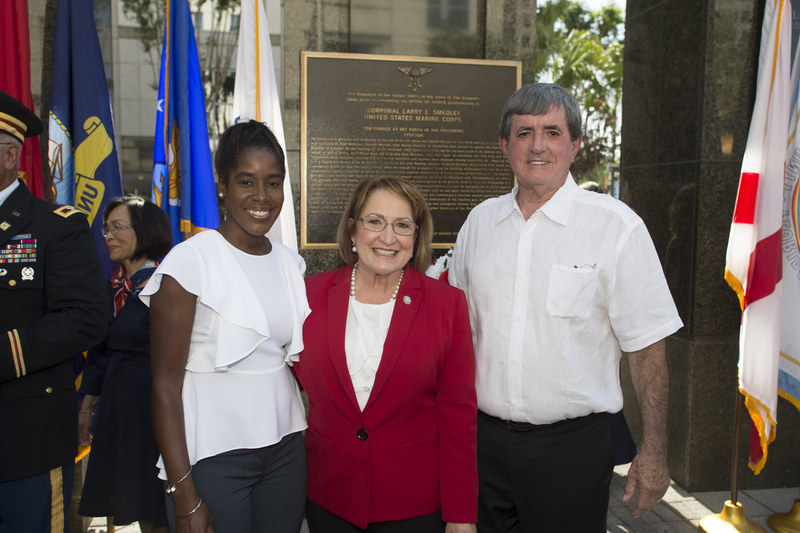 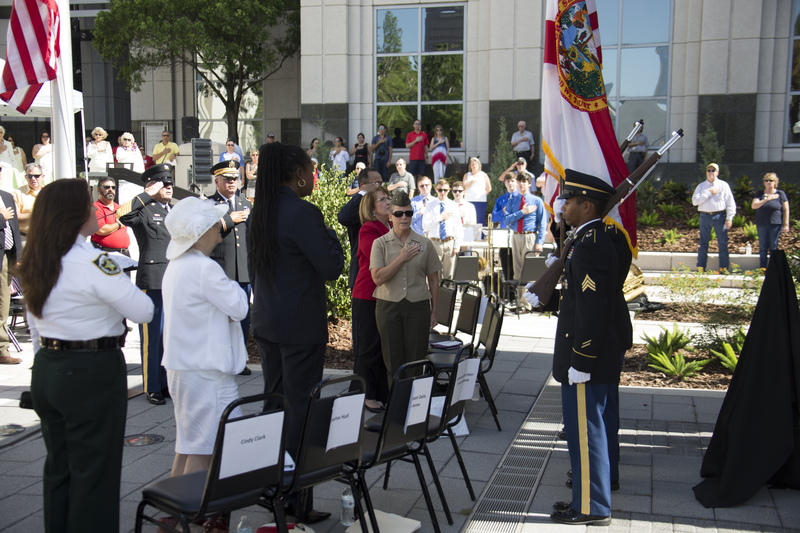 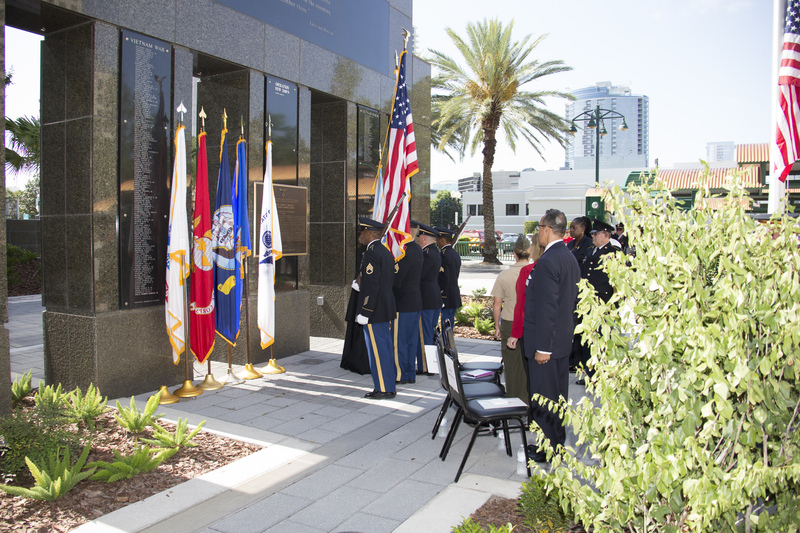 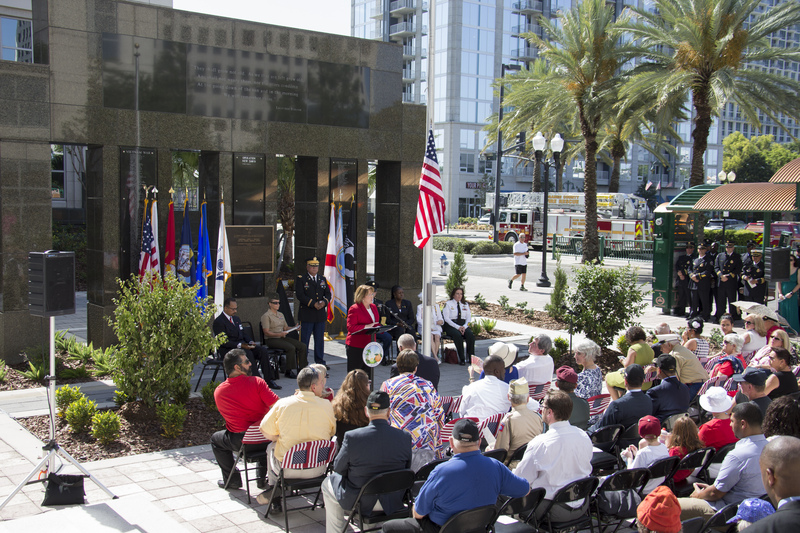 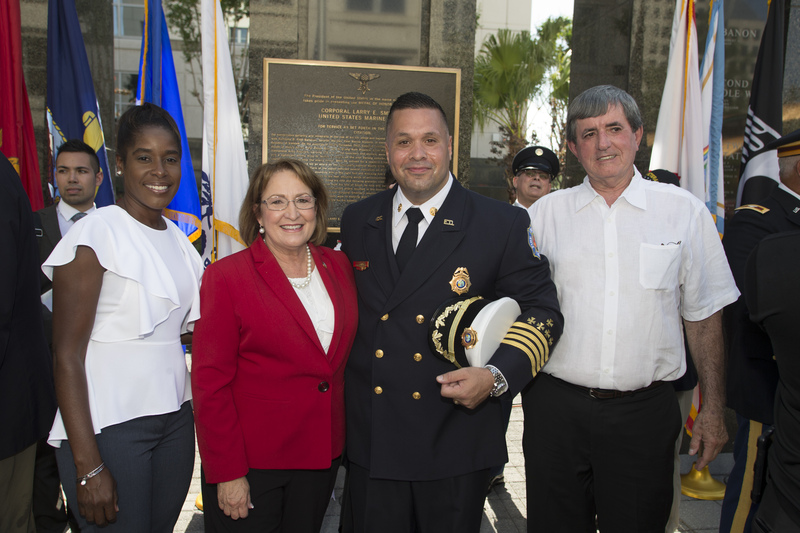 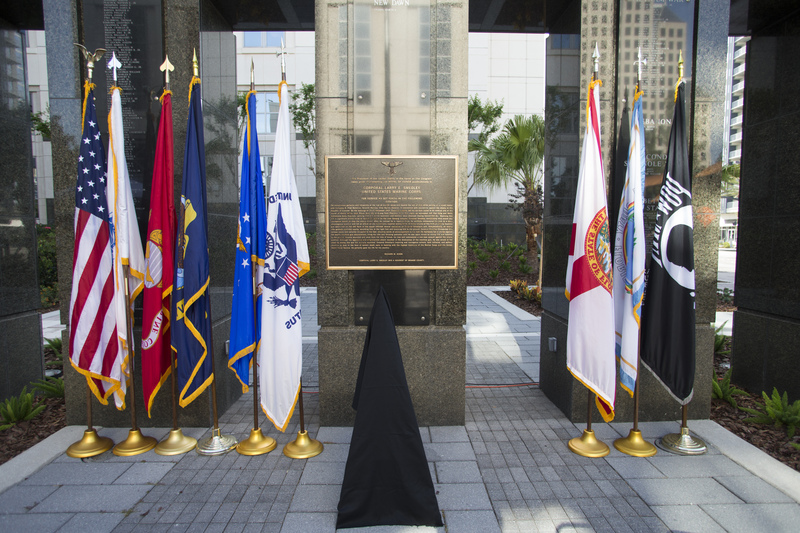 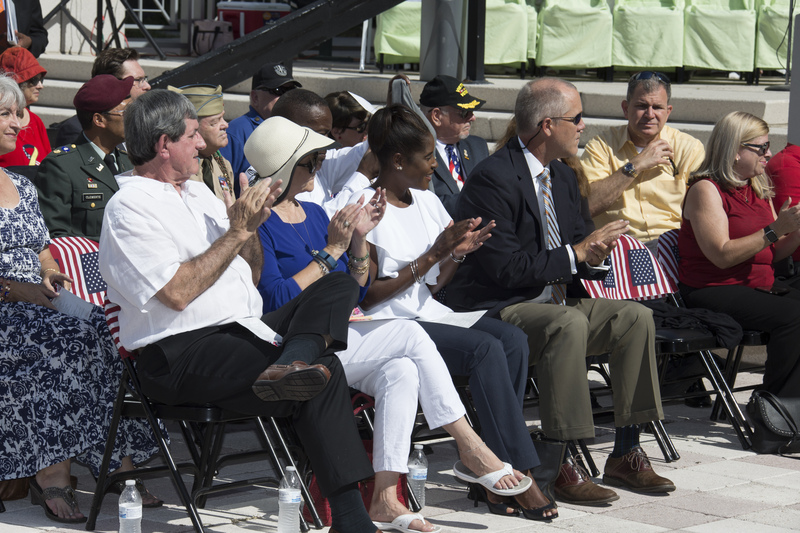 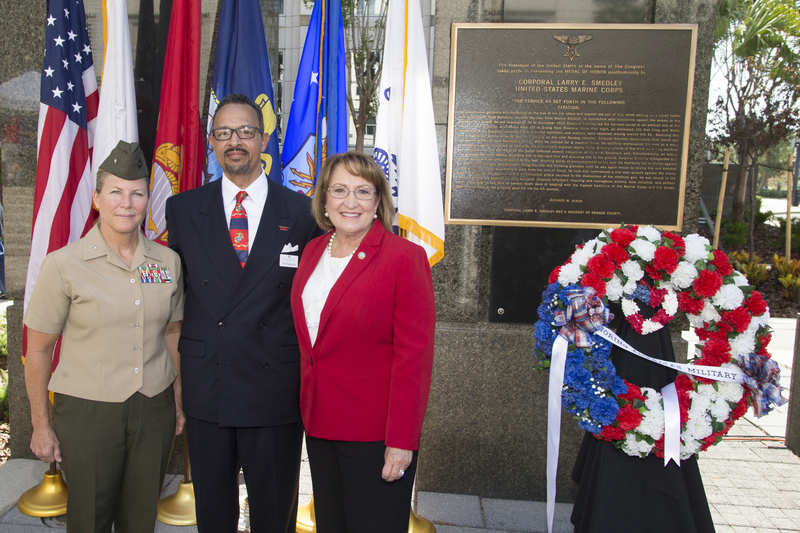 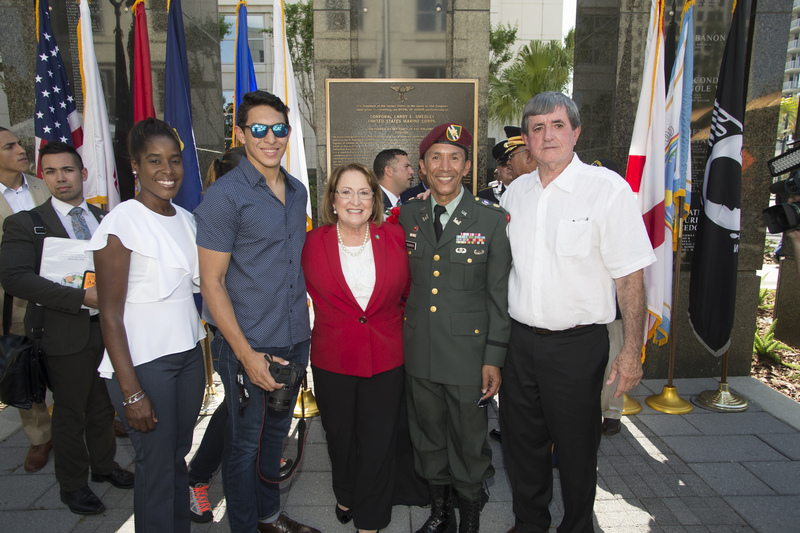 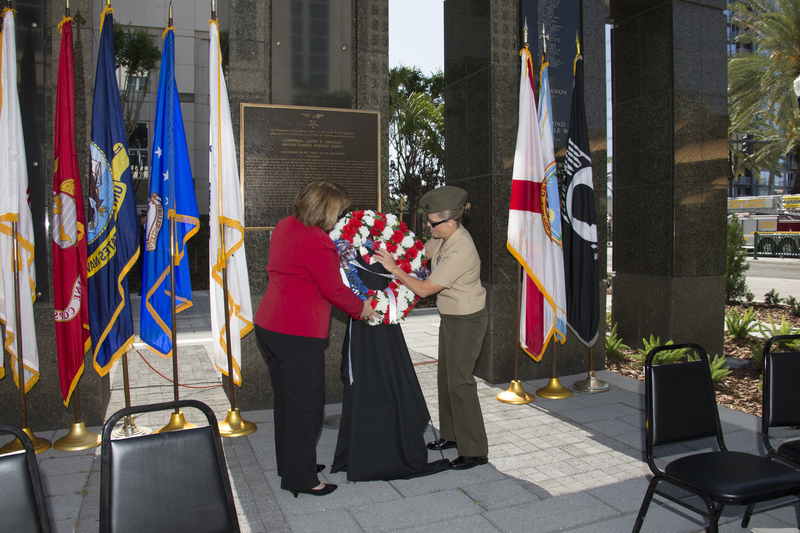 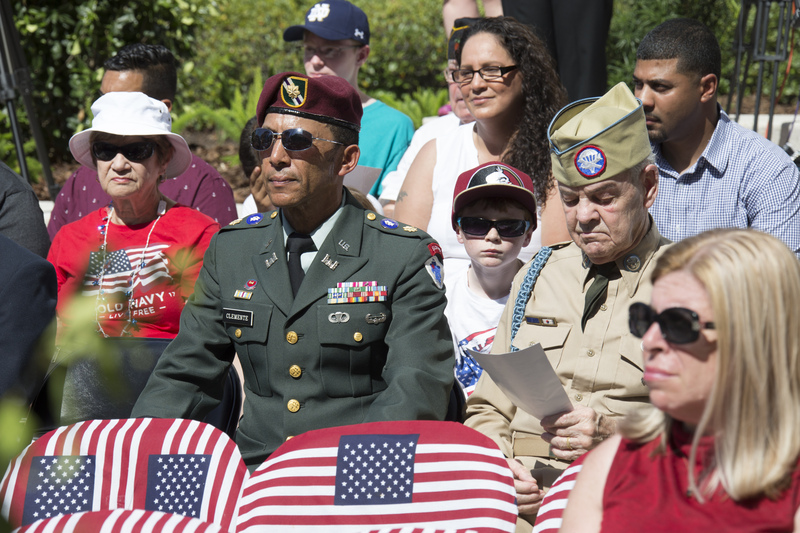 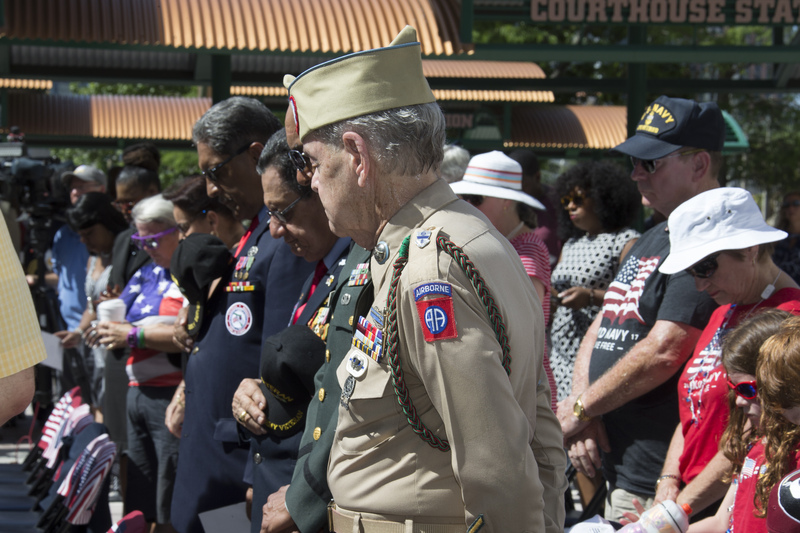 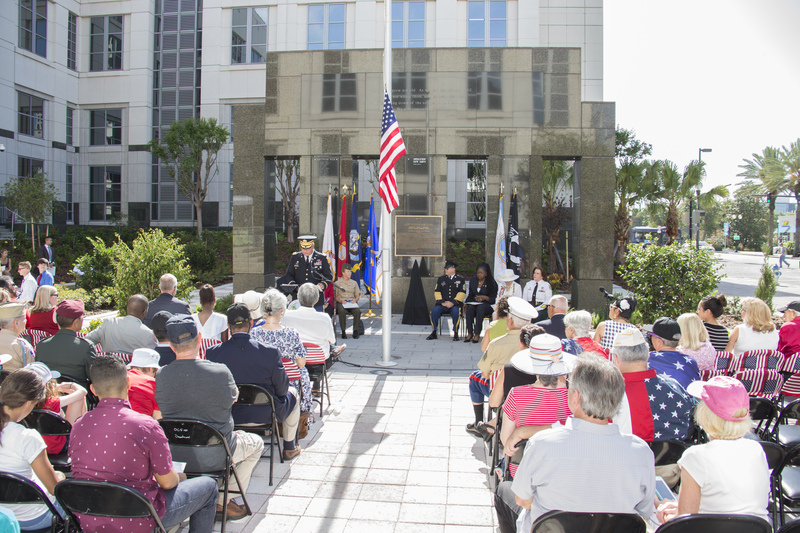 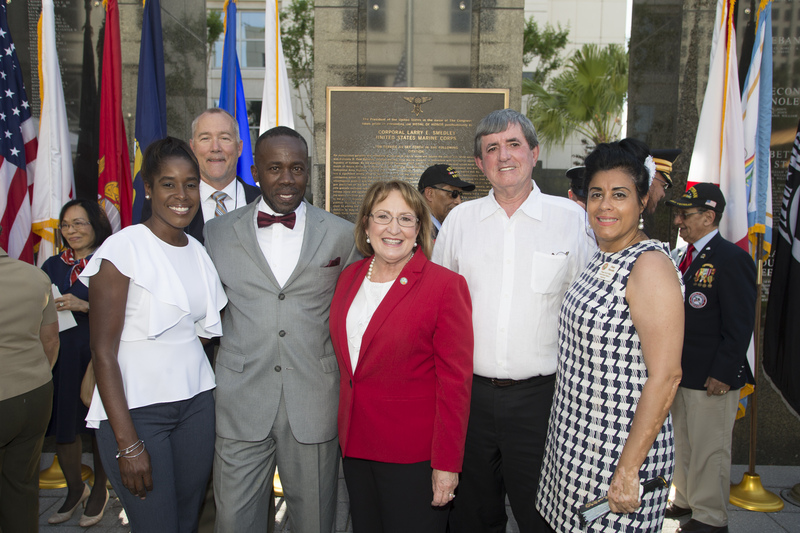 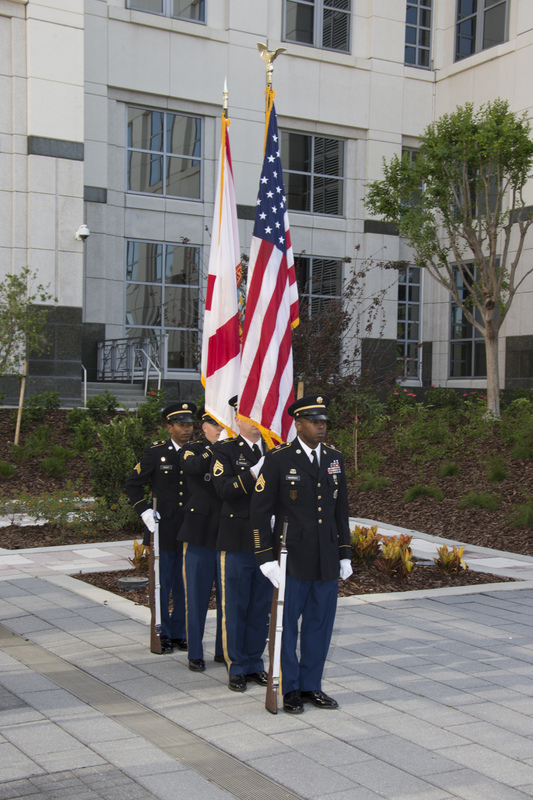 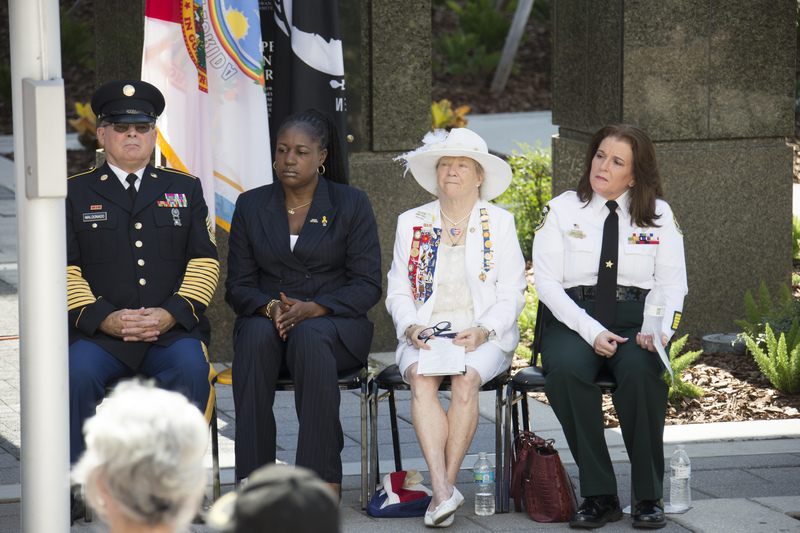 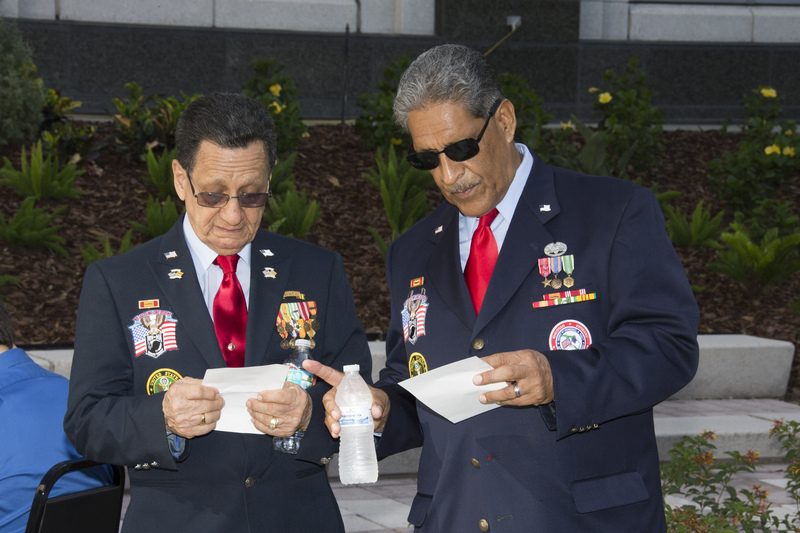 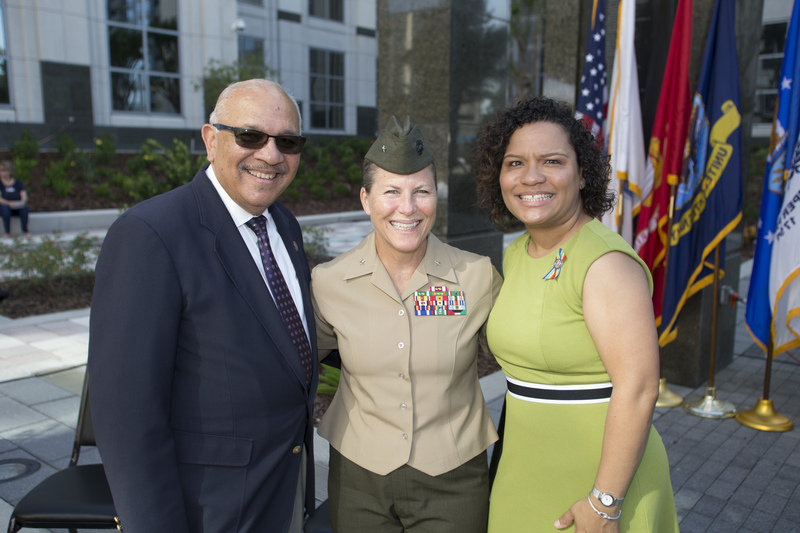 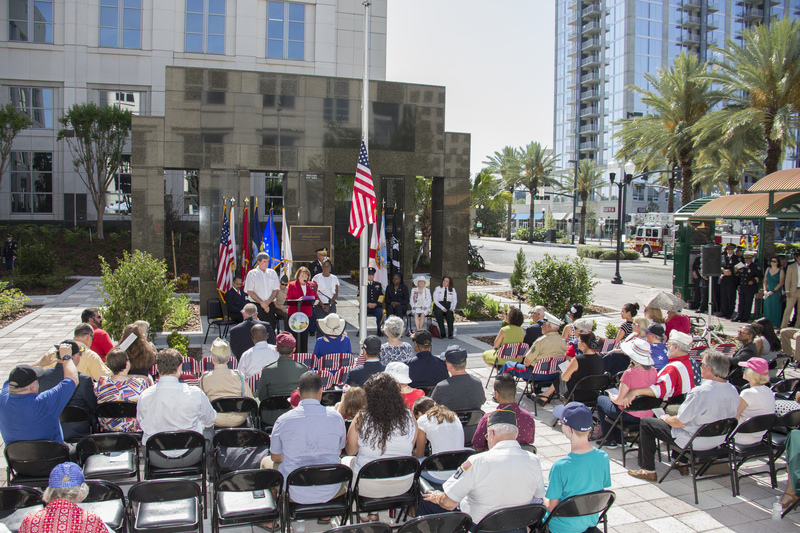 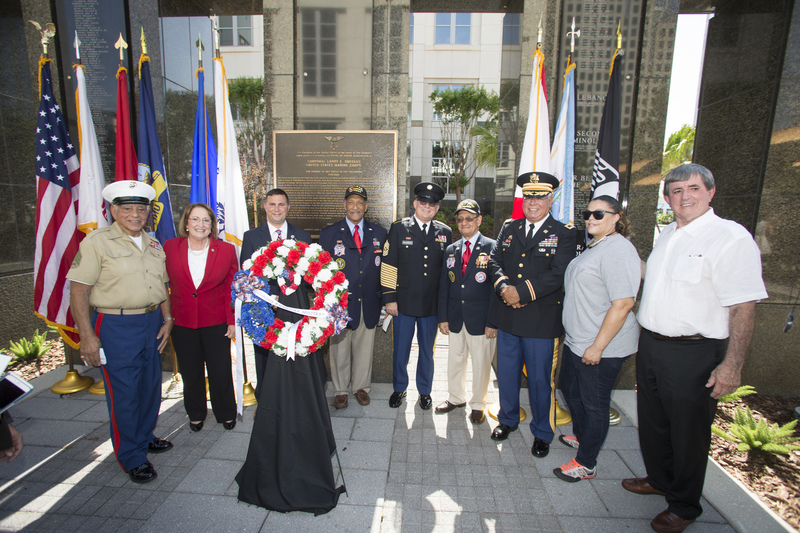 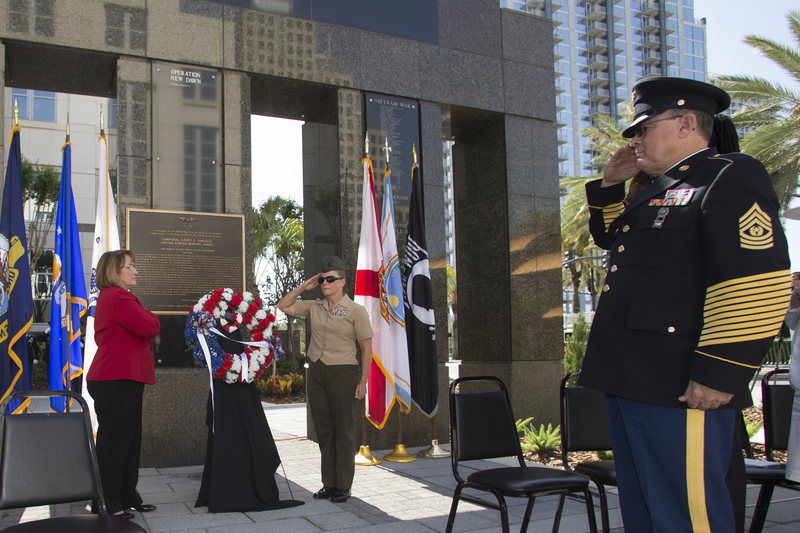 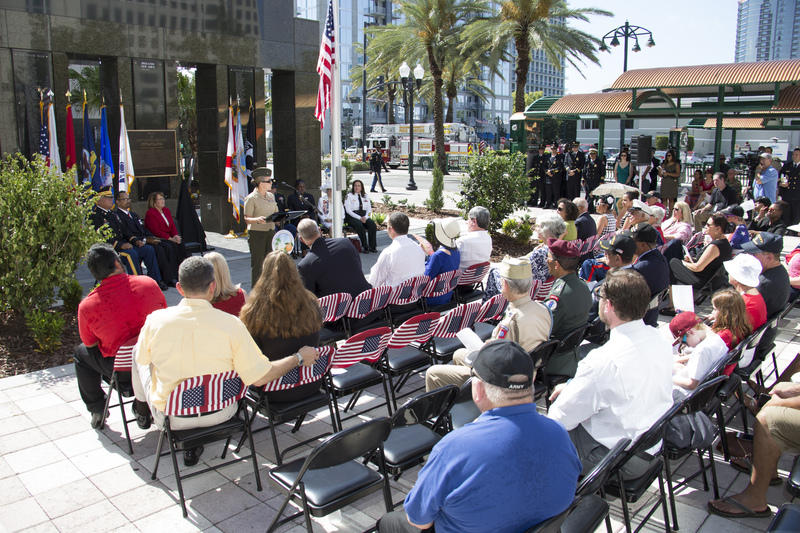 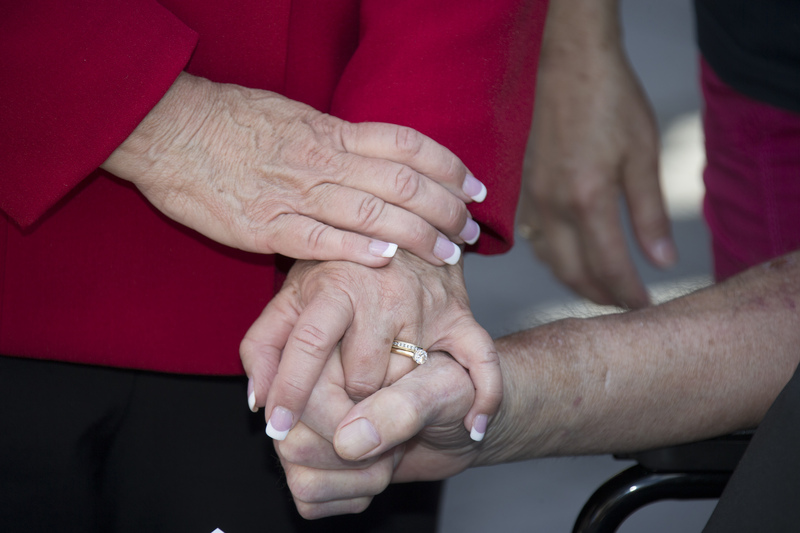 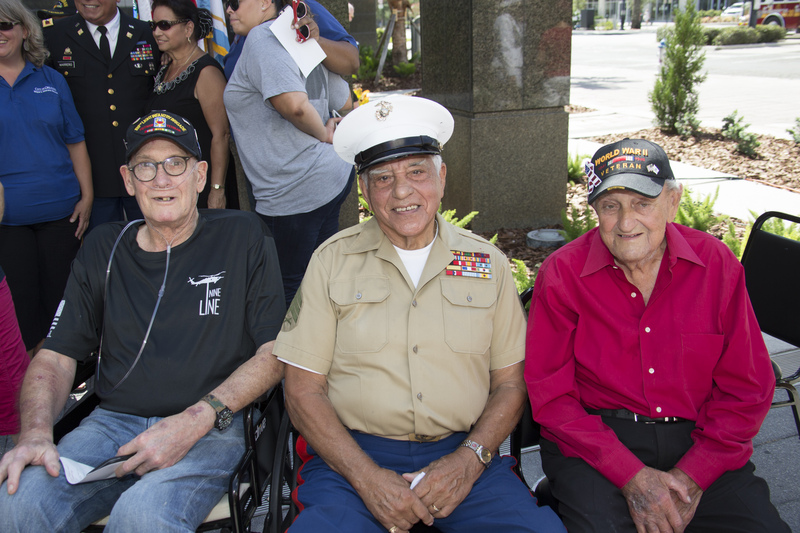 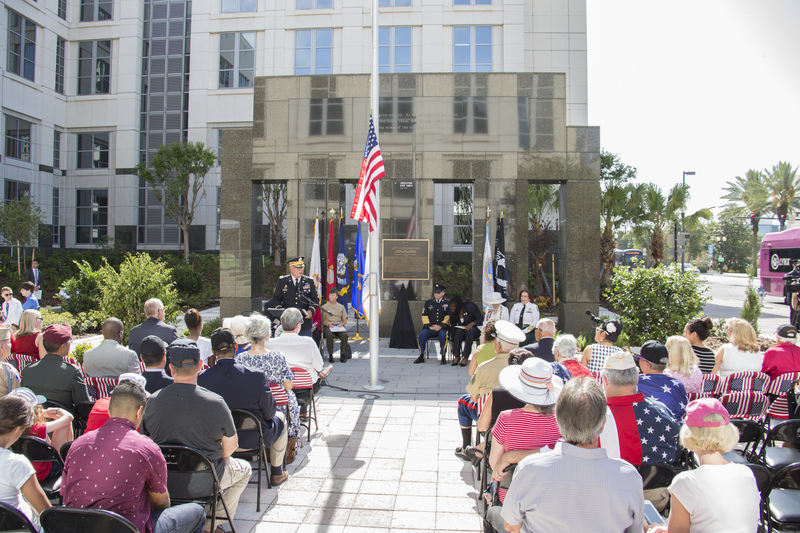 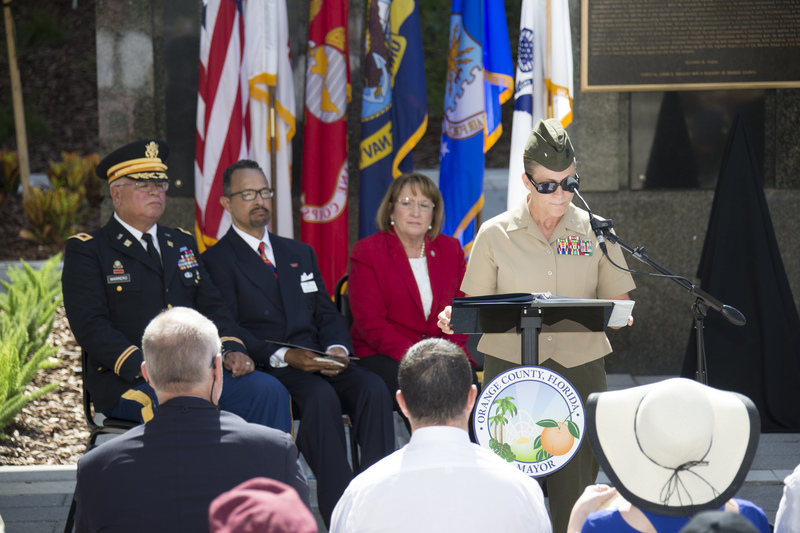 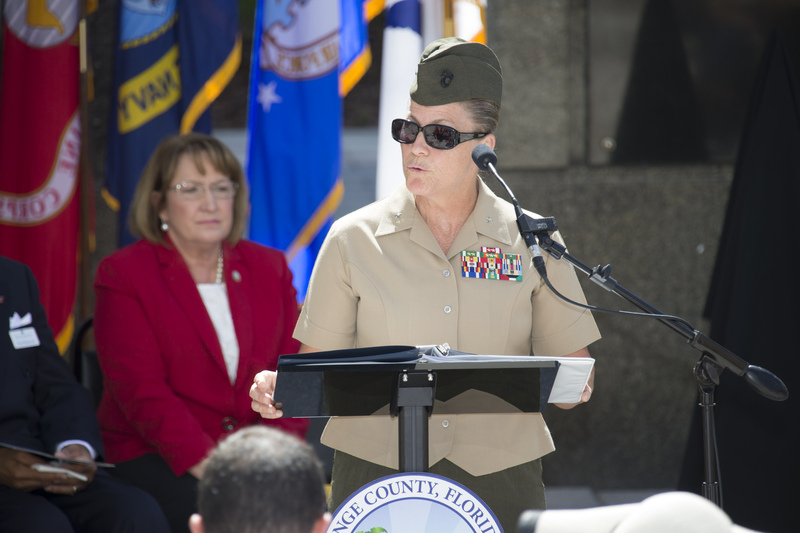 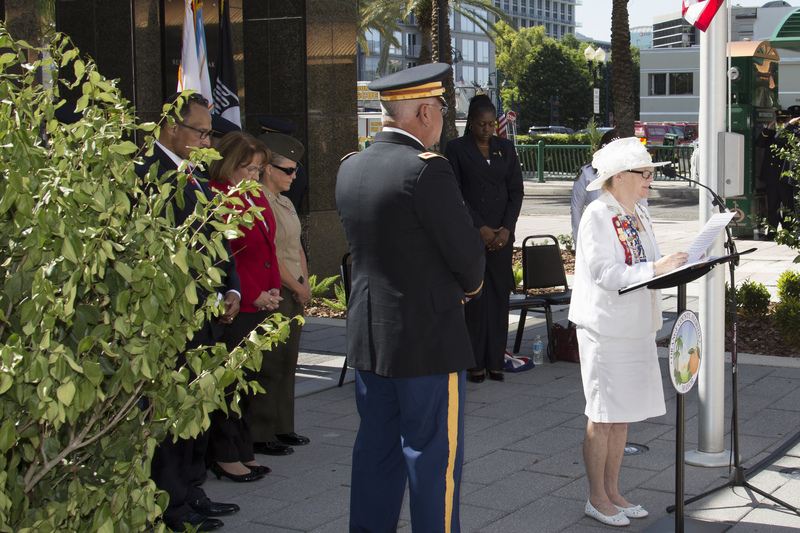 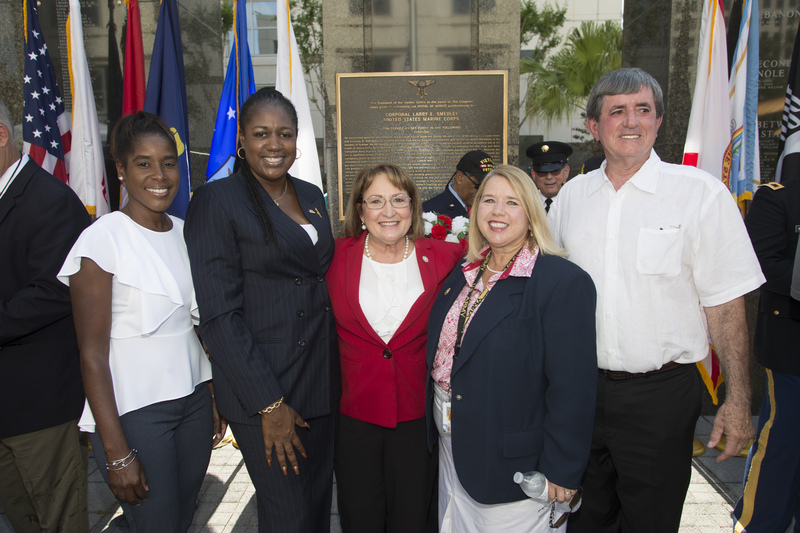 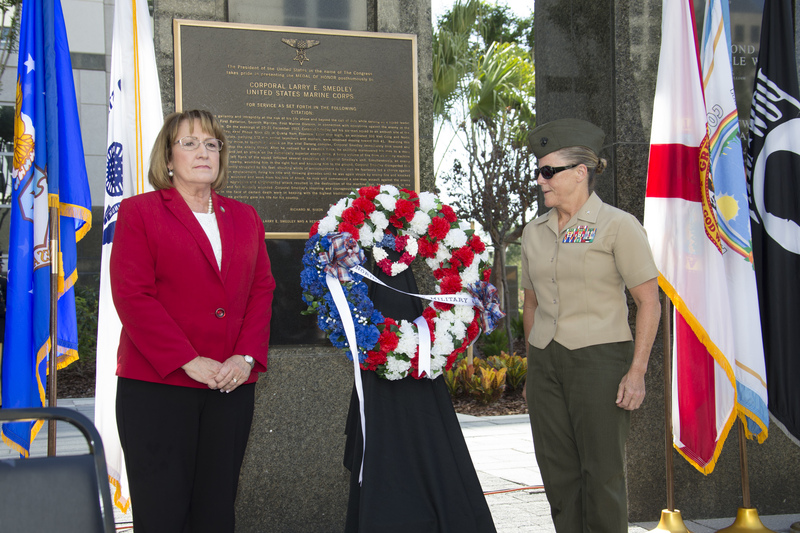 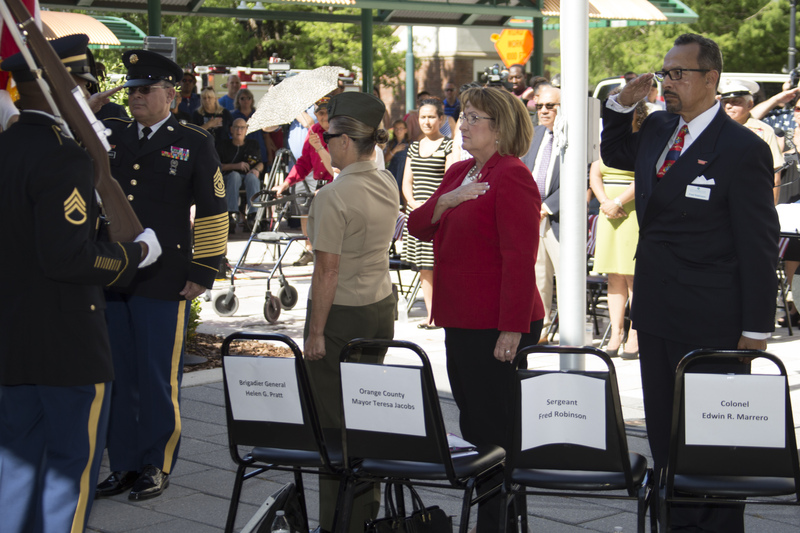 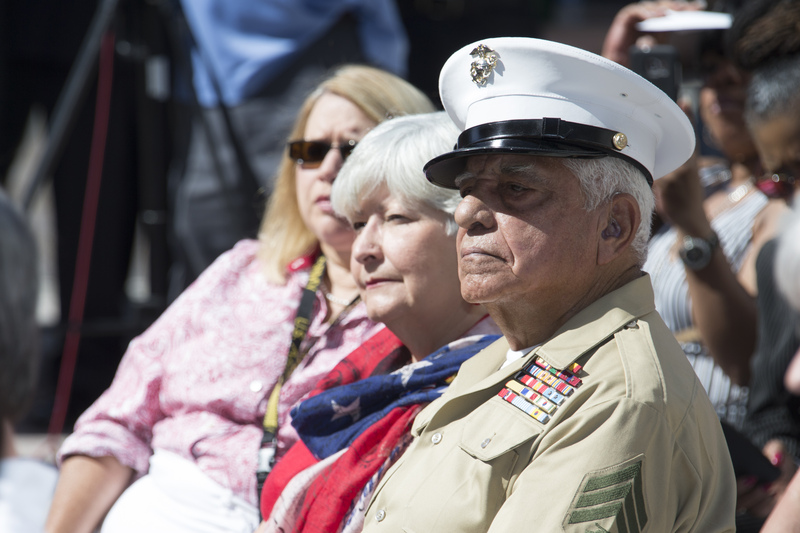 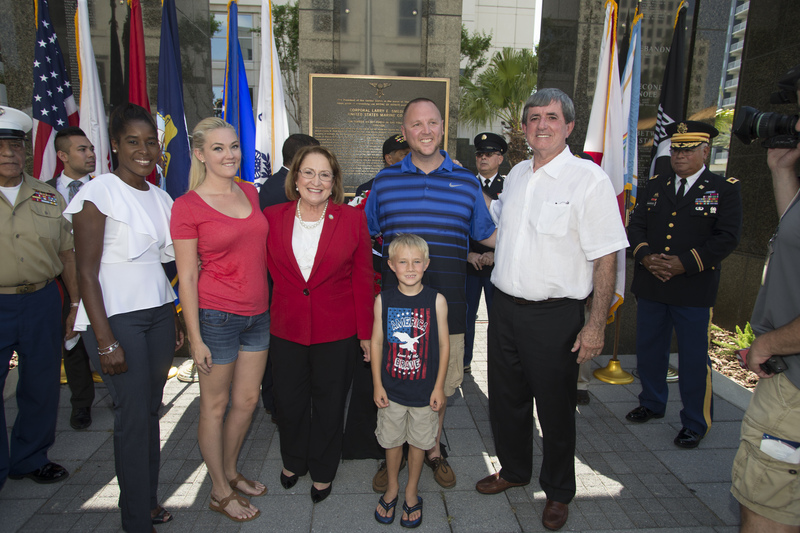 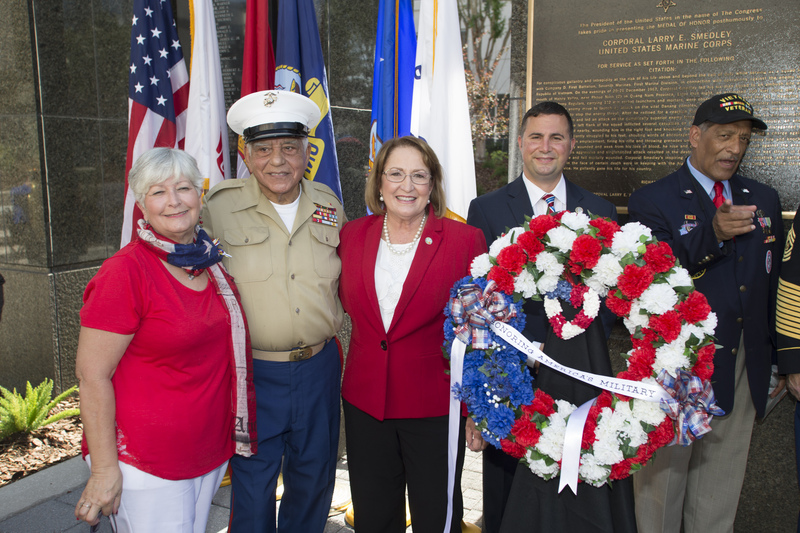 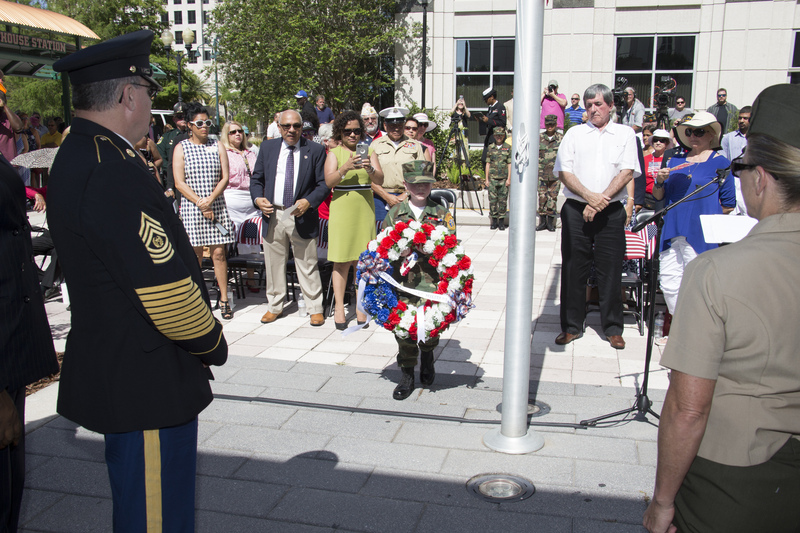 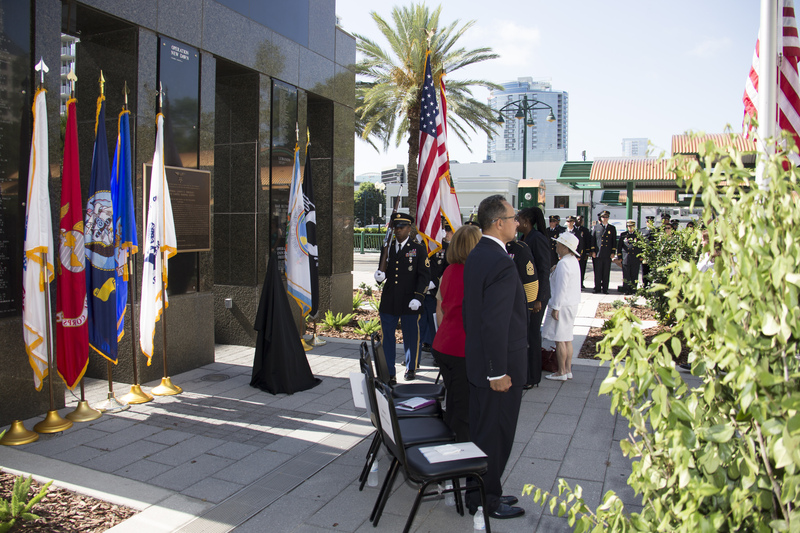 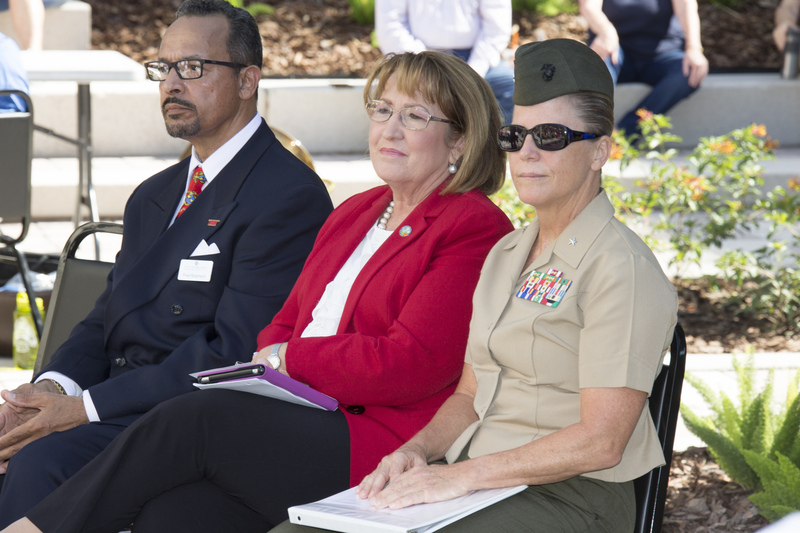 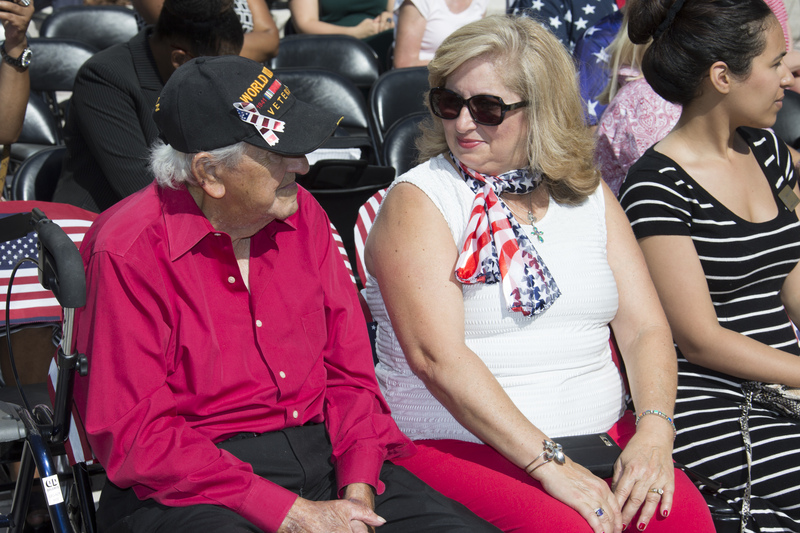 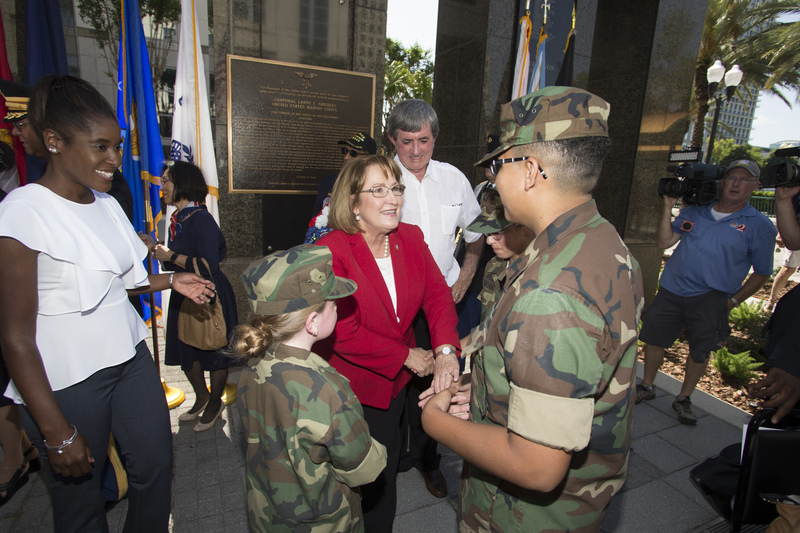 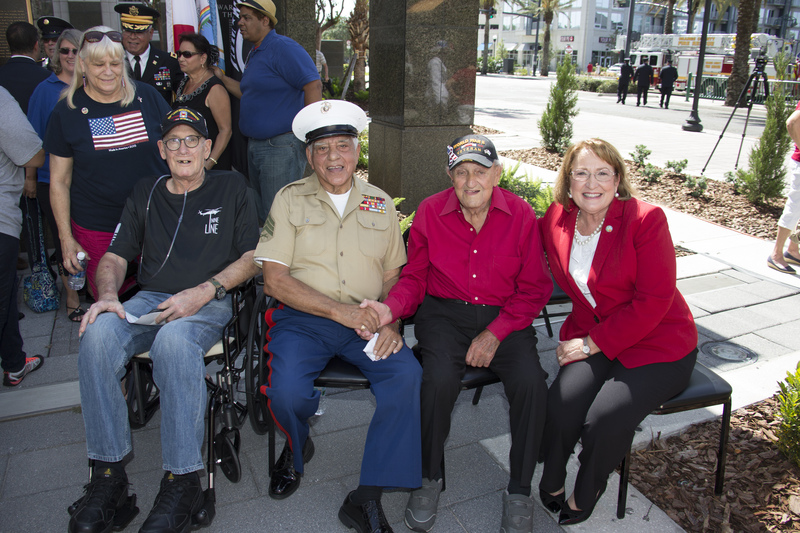 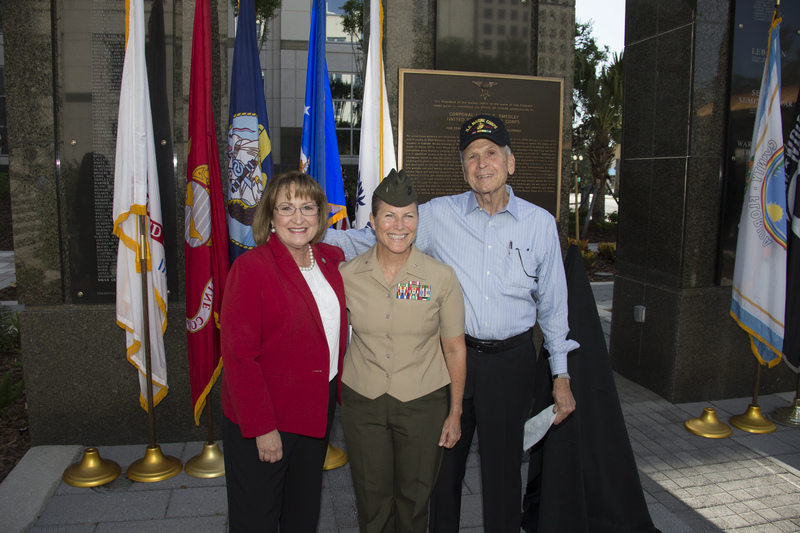 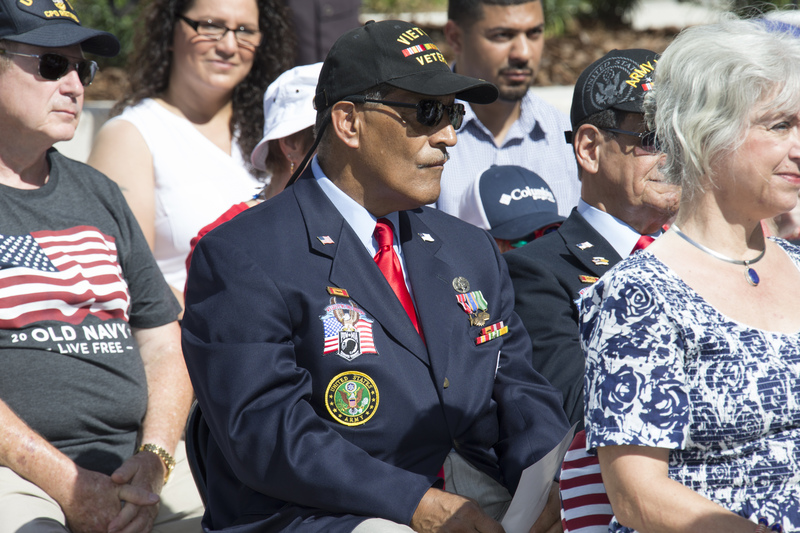 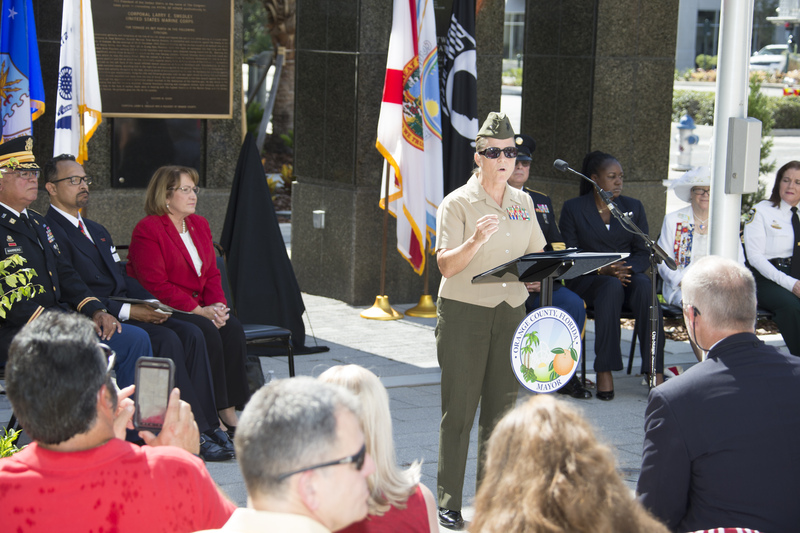 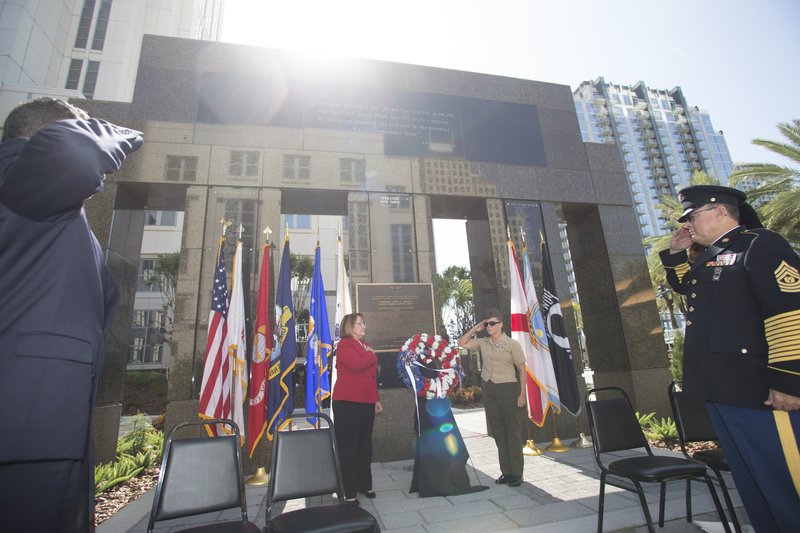 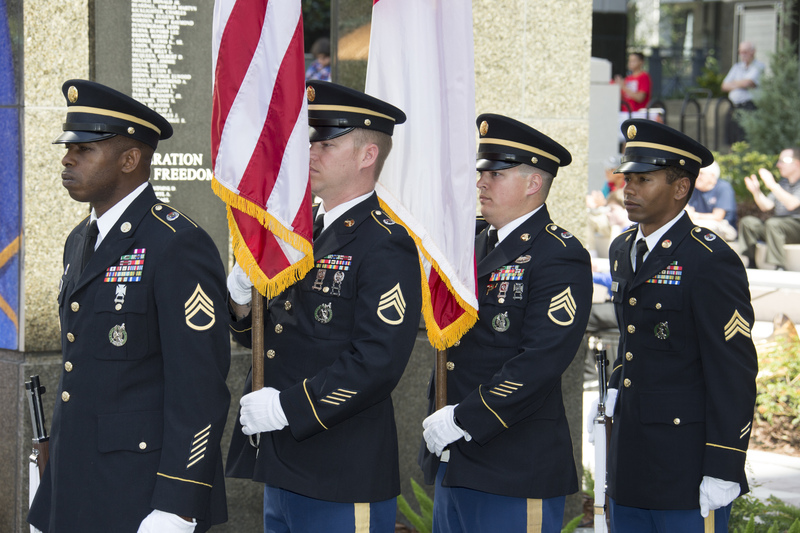 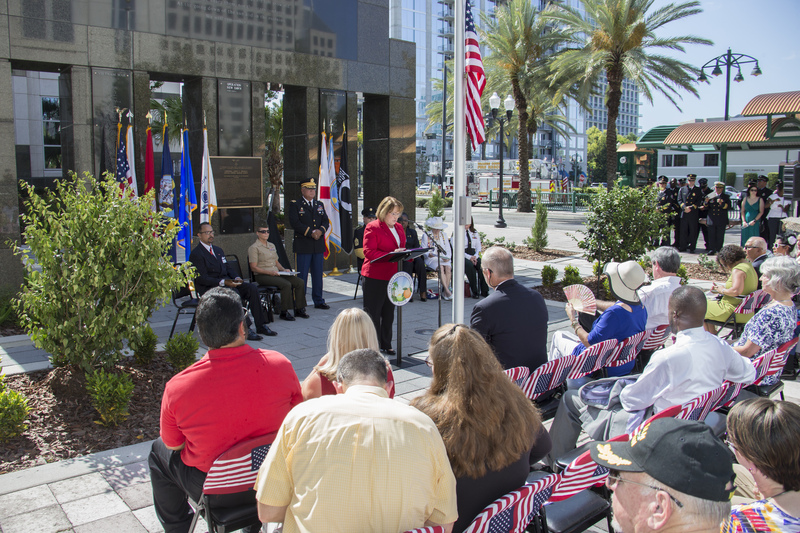 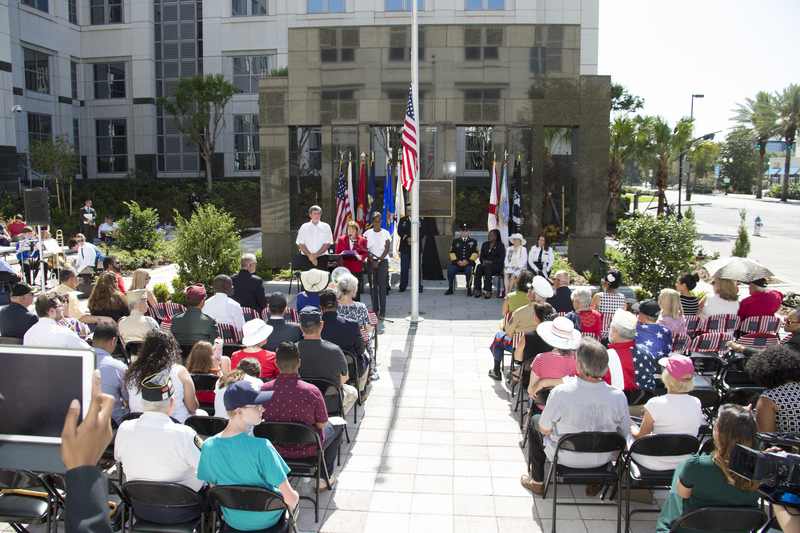 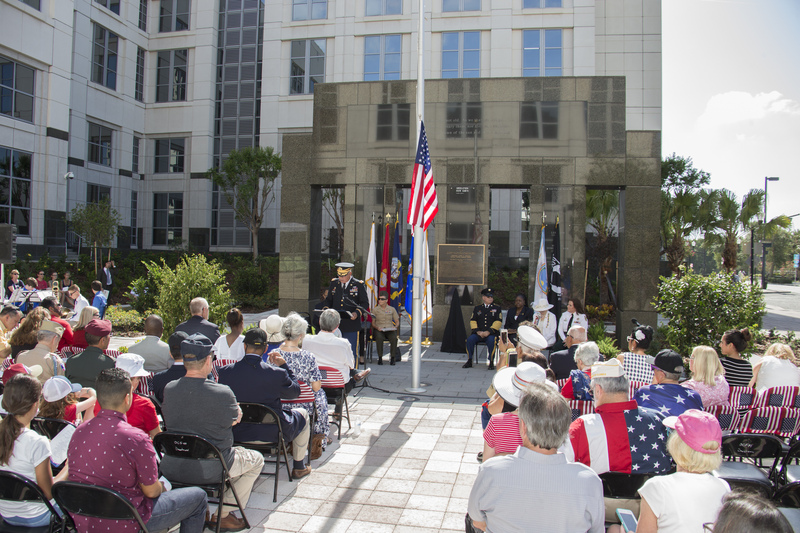 Photo Caption: U.S. Marine Corps Reserve Brigadier General Helen G. Pratt, City of Orlando Mayor’s Veterans Advisory Council member Sergeant Fred Robinson and Orange County Mayor Teresa Jacobs honor the nation’s fallen heroes at the 2017 Orange County War Memorial Commemoration Ceremony at the Orange County Courthouse.